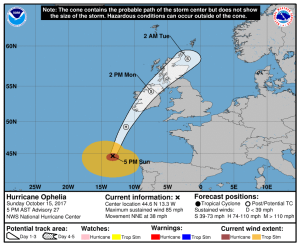 Hurricane Ophelia Making Her Final Approach… into Ireland? 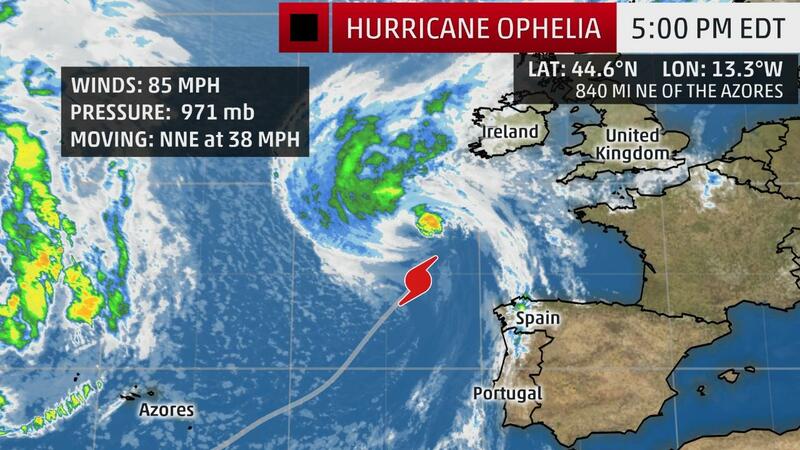 You read that headline right – A hurricane is heading towards Ireland and Scotland. Hurricane Ophelia has captured the world’s attention this past week as it takes aim at the United Kingdom. 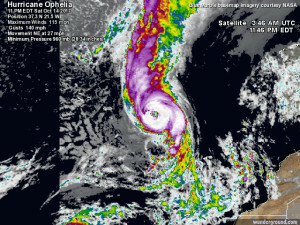 Ophelia becomes the 10th consecutive Atlantic named storm this hurricane season and has also become the sixth major hurricane of the 2017 Atlantic hurricane season. According to Dr. Phil Klotzbach from Colorado State University 2017 is now tied for the most major hurricanes (Cat. 3 and higher) through Oct. 14 with 1933, 1961, 1964 and 2004. Yesterday, October 14, 2017 Ophelia reached peak intensity at Category 3 status with winds of 115 mph. 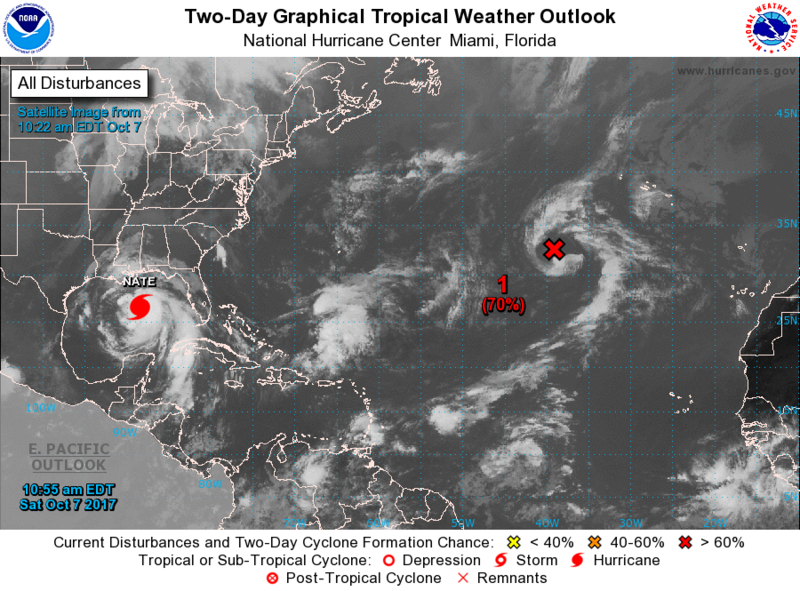 Additionally, Dr. Phil Klotzbach states that Ophelia has broken a few records on her own including becoming the farthest east (26.6°W) Atlantic major hurricane on record. It’s incredible to think that a hurricane can evolve to this strength over waters that are typically very cool and an atmosphere that is usually harsh. 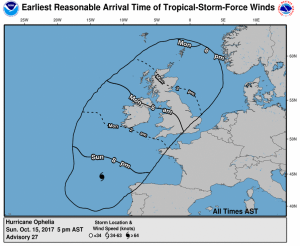 The truth is that Ophelia has managed to stay over waters that have been about 2 degree celsius warmer for this time of the year which has helped Ophelia maintain tropical characteristics and strength as it sluggishly moved eastward while south of the Azores. This is not the first time that a powerful storm of tropical origin has impacted western Europe. Usually by the time these storms make it this far east they are weak and have undergone extratropical transition. 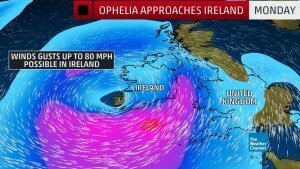 What makes Ophelia so formidable has to do with her hurricane force strength. Ophelia may have undergone and completed her extratropical transition into a cold core system but she is still maintaining a strong Category 1 strength on its final approach into Ireland. Due to the transition the storm underwent,the moisture and winds have separated themselves, which is a typical scenario for extratropical systems. The majority of the rain is located to the northwest side of the center of low pressure, while the strong hurricane force winds separated to the eastern side of the storm. Depending on where/if the storm comes ashore will depend on what type of damage various areas will see. If the storm hits southern Ireland directly and continues inland across the island and into Scotland, winds will be the major concern for eastern Ireland, Scotland, Wales, and England; whereas the west side of Ireland, Northern Ireland, and parts of Scotland will see more of a flooding and rain event. However, if Ophelia stays offshore and brushes Ireland’s eastern coast these areas will see more of a wind impact with the majority of the rain remaining offshore. The problem is that Ireland will likely be experiencing one of the strongest storms in recorded history due to the fact that Ophelia is not weakening fast enough and maintaining hurricane force strength. With an impact expected tomorrow late morning (October 16, 2017) the United Kingdom has only a few short hours left to prepare for an event that is considered “strange”. Ophelia is being called “Ex-Hurricane Ophelia” meaning that it is still maintaining hurricane strength but it has undergone its extratropical transition. Due to the strength and proximity to shore the Met Office and National Hurricane Center have been referring to the storm by name, but typically once a storm transitions hurricane advisories tend to be discontinued. This is a good operation to keep referring to the storm as a hurricane on many scientific levels, but above all else it is important to the public. Once you give a name to a storm the public begins to listen closely and take the storm more seriously compared to an event that does not have a name assigned to it. 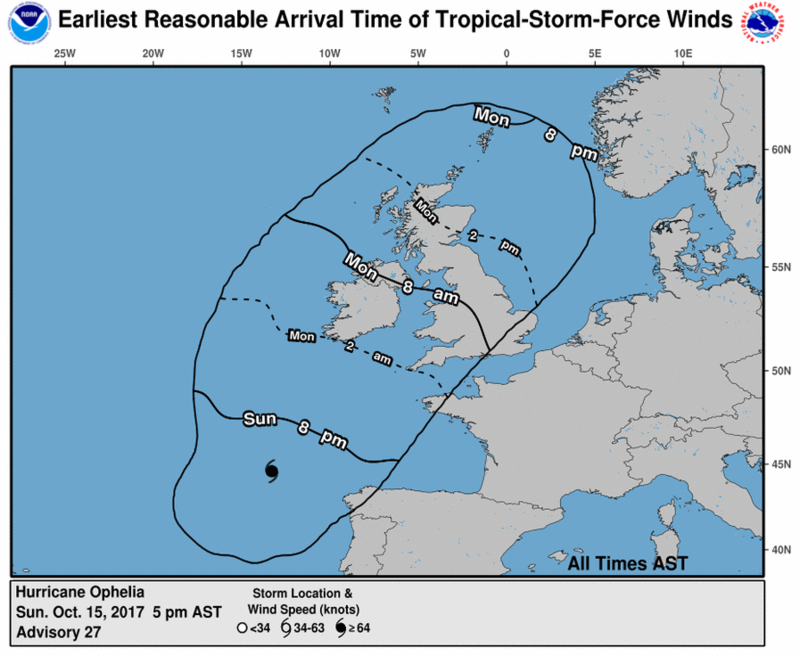 The United Kingdom and Northern Ireland have already taken action to prepare citizens in the path of Ophelia. Airports in Ireland are planned to be closed for the storm and are scheduled to reopen Tuesday to full operation pending damage. Airlines have also cancelled numerous flights across the United Kingdom starting tonight and lasting until Tuesday or until conditions improve. Schools and Universities have been closed across the United Kingdom and transportation via railway and boat have also been suspended as Opehlia pushes ashore and carves a path across Ireland and Scotland. Businesses and government offices will also be closed across Ireland, Northern Ireland, and Scotland with the Met Office advising residents to stay indoors and bring in/secure objects that could potentially be picked up by the powerful Category 1 winds. Additionally residents are warned of the potential for heavy flooding and high seas along the coastlines. While not the first tropical origin storm to hit western Europe Ophelia will be one of the strongest to impact on record. Europe is not used to seeing these type of tropical synoptic scale events and thus many residents (especially younger generations) do not fully comprehend the dynamics and threats behind a hurricane, even one that has transitioned. The last time this type of event occurred was during Hurricane Debbie in 1961. Residents should heed the warnings from the Met Office and stay indoors until the storm has fully passed. 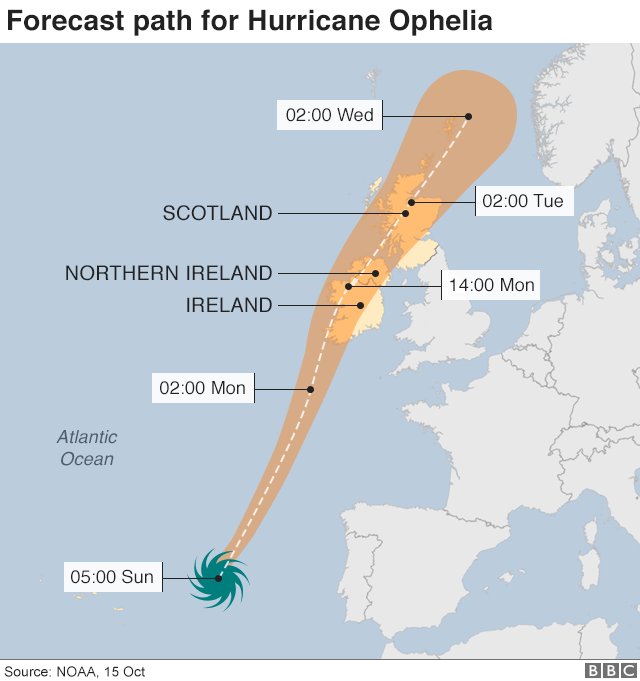 This will be a fairly fast event as Opehlia is picking up speed and currently moving swiftly to the NNE at almost 40 mph. Monday will be the big day for Ireland, Whales and England with strong winds of around 80 mph being forecasted for the region along with heavy rains. Scotland can expect these impacts for Tuesday. 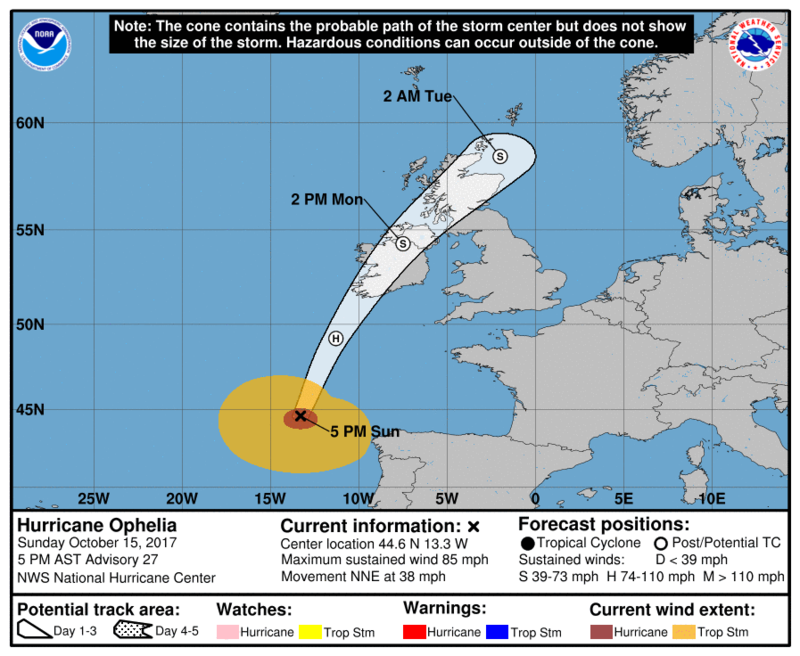 Ophelia is expected to weaken to Tropical Storm status by the time it reaches the Northern Ireland and the Scotland area. By Wednesday the system will be moving away from Scotland further north and conditions will begin to improve. Expect a rough couple of days if you are in the United Kingdom and Northern Ireland areas because believe it or not a Category 1 hurricane is taking aim for a direct landfall tomorrow. 2017 has been a wild hurricane season and it is still not over yet. Not only have we seen many destructive storms but now we are experiencing first hand hurricanes forming and impacting areas outside of typical hurricane prone areas. If this hurricane season has taught us anything it is the fact that no matter where we are we need to prepare for these events and be aware that anything is possible when it comes to a hurricane. 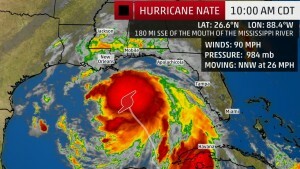 October 7 marks the 1 year anniversary since Hurricane Matthew impacted the Central and North Florida east coast, but now we will have another hurricane to remember for this date: Hurricane Nate. Nate started off as a disorganized tropical wave due to the high wind shear down by Nicaragua. 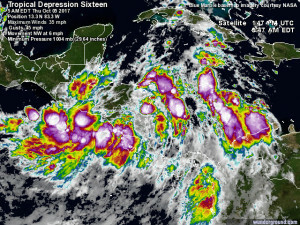 Due to the slow development and movement this system produced heavy rains to Central America causing mudslides, road failures, and flooding in the mountainous regions. Eleven deaths have been reported in Nicaragua, ten in Costa Rica, and one in Honduras. 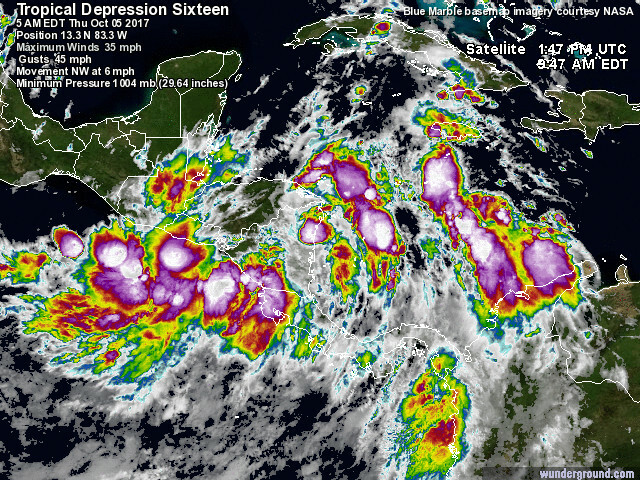 Once Tropical Depression 16 started to pick up speed and head northward it entered into a prime area for development. Instead of the harsh wind shear environment it was experiencing in Central America it punched through into an area with minimal wind shear. 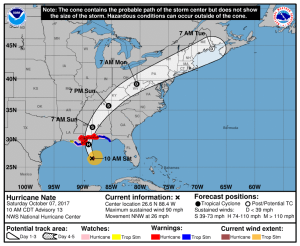 This allowed for the system to rapidly organize and intensify into Tropical Storm Nate on October 6 and then continue onto Hurricane status on October 7. Hurricane Hunters have been investigating the system nonstop for the past couple of days and unfortunately have determined a strengthening pattern during each flight mission. Not only is Nate taking advantage of the low wind shear but also the warm sea surface temperatures in the Gulf of Mexico. In order to form and develop a hurricane requires sea surface temperatures of at least 26.5°C and Nate is currently over water that is closer to 30°C. Everything is working in Nate’s favor and this is why Nate is a serious threat to the Gulf Coast, especially the New Orleans area. New Orleans is no stranger to hurricanes but the city in general is in a terrible place regardless of the strength of an approaching hurricane. When Hurricane Katrina (2005) came shore it was a Category 3 storm on the Saffir-Simpson Hurricane Scale. Yet, the immense storm surge, flooding, fatalities, and damage made it seem more like a Category 5 storm. This all has to do with the location of New Orleans and the geography of the ocean floor. New Orleans is a city that is below sea level, and borders the Gulf of Mexico. It is a vulnerable city that is surrounded by levees and pumping systems which tries to protect their below sea level area. However, these flooding systems are meant to handle smaller storms not large scale hurricanes that could potentially stall or move slowly over a region. Even on a normal storm day New Orleans has trouble keeping flood waters out. It is not the rain that New Orleans should be concerned about, but the storm surge from hurricanes. The Gulf of Mexico is shallow compared to the open waters of the Atlantic. The closer you approach the Gulf Coast the more shallow the water becomes. Additionally the Gulf of Mexico can be seen as a large warm bath tub. Once a storm enters into this area someone will be impacted. It is too small of an area for a storm to dissipate completely and land surrounds all sides. 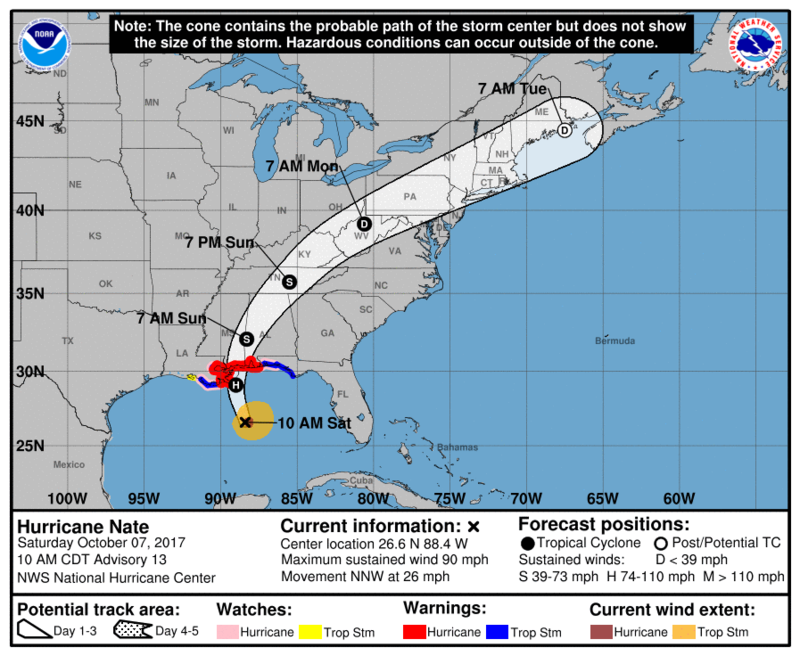 So when a hurricane enters this area and moves northward (like what Nate is doing) it is like you are pushing yourself forward in the bath tub. The water moves forward and pushes itself over the rim of the bath tub. 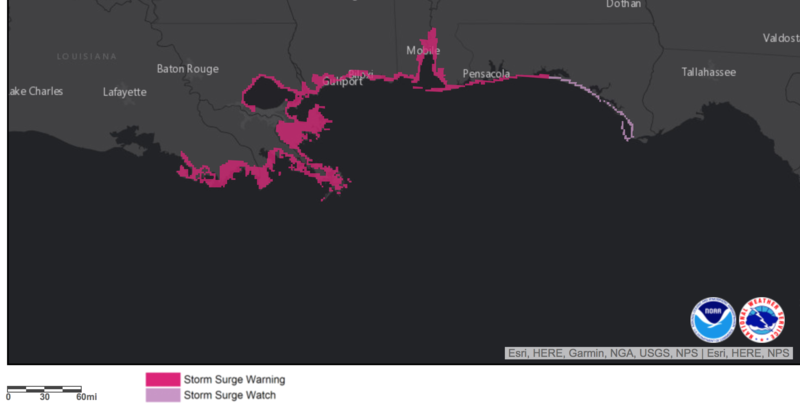 This is exactly what storm surge does in a hurricane that is located in the Gulf of Mexico. This is why the storm surge in this particular area is always higher compared to areas that boarder the Atlantic or the Pacific Ocean. Louisiana and Mississippi have been on high alert and scrambling to evacuate and prepare residents for the arrival of Nate. Nate is continuing to rapidly intensify and the forecast is for the storm to strengthen into at least a Category 2 hurricane prior to landfall late tonight (October 7, 2017). However, this has been an active and formidable hurricane season in general, and given the intensification and prime area Nate is currently in we should not be surprised to see Nate become a Category 3 storm. Hurricane Harvey did just that right before landfall and became a Category 4 hurricane catching many off guard . 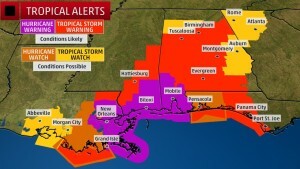 Residents are taking the warning seriously across the Gulf States and heeding evacuations orders. Nate is expected to impact the same areas that Katrina devastated 12 years ago. While Nate is not forecasted at the moment to be as strong as Katrina the storm surge and flooding potential is still the main and deadly threat with this system. 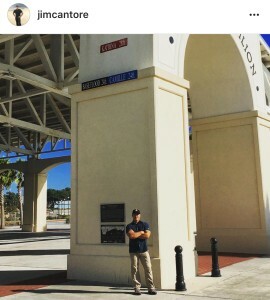 Jim stands by a post which marks the maximum storm surge heights of Hurricane Camille (1969) and Hurricane Katrina (2005) in the New Orleans area. When Hurricane Camille came ashore it was a Category 5 compared to Hurricane Katrina which was “only” a Category 3. Yet look at how Katrina produced a higher storm surge compared to Camille. There are many meteorological factors that point to the size and forward motion as the main differences between these two hurricanes and why a Cat 5 storm (Camille) produced a lower storm surge. However, the point to note here is that we should not be concerned and focused on the Category of the system. The topography and location of this area is such that any Hurricane Category will produce a massive storm surge for this area. Currently Nate is not nearly as large as Katrina and is moving fairly fast across the Gulf of Mexico and is forecasted to continue its rapid motion as it impacts the Gulf Coast. This will help to lessen the duration and extent of the storm surge in this area, which is a blessing. Luckily we are not expecting a slow moving system such as Hurricane Harvey. 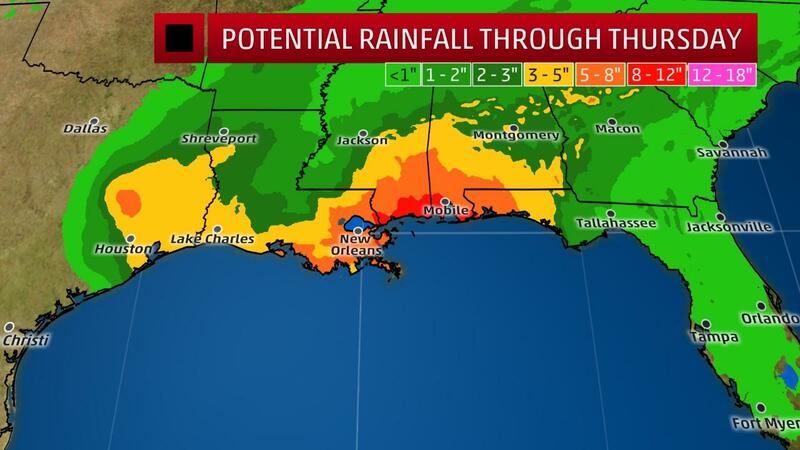 The Baton Rouge area and New Orleans is expected to receive a storm surge of up to 11 feet which is still significant regardless of the speed this system is moving. Surge values will likely by highest on the northeast side of the center of low pressure (the eye of the storm). Another blessing in disguise has to do with the rain forecast. Because Nate is moving fairly fast (about 23 mph) it will push through the area quickly only delivering about 8 inches of rain at most to the majority of areas around the impact site. However, some areas could see closer to a foot of rain which will lead to widespread flooding. Nate is expected to grow in size once it impacts land and could undergo extratropical transition over land which will allow the storm to grow and lengthen into a cold core system (a typical low pressure system that delivers heavy rain and thunderstorm activity over the continental United States for example). However, if a system grows this will allow more moisture to be retained in the cloud tops. 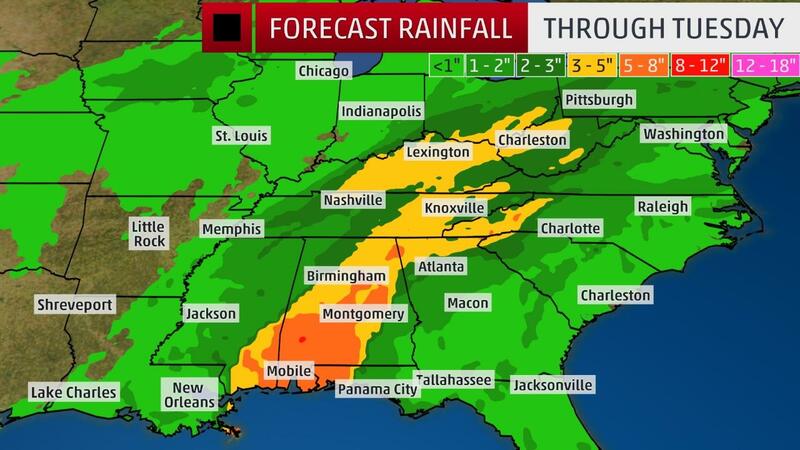 Areas like Alabama and Tennessee should be aware of the potential for flooding because Nate’s possible expansion, especially in mountainous areas. 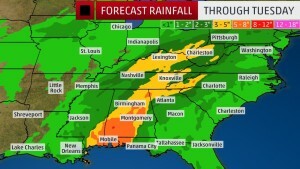 Likely we will see the heaviest rains being produced in Alabama and Tennessee compared to Louisiana and Mississippi which will receive the brunt of the heavy winds and storm surge. In Louisiana, Gov. John Bel Edwards declared a state of emergency and mobilized 1,300 National Guard troops. Government officials in New Orleans have been mobilizing emergency personnel to prepare for flooding ahead of Nate. The past few months have been difficult for the Louisiana area due to heavy rains, especially from Hurricane Harvey which stalled over the eastern Texas area in late August. Repairs have been ongoing across the state to try and drain flood waters and repair pumps before Nate’s arrival late tonight. Mandatory evacuations are ordered in Venetian Isles, Lake Catherine and Irish Bayou sections of New Orleans. In Alabama, Governor Kay Ivey on Friday signed a statewide emergency declaration. The Mobile Regional Airport is currently closed in preparation for the storm. It is expected to reopen Sunday at noon pending damage. The Pensacola International Airport in Florida plans to cease operations Saturday night and remain closed throughout Sunday. Nate is on track to directly impact the Gulf Coast late tonight and early tomorrow morning. Residents should be rushing their preparations to completion at this point. If you have not evacuated these are the last few hours to do so, especially if you live in an area prone to flooding. While this wave is not tropical in origin it could gain some tropical characteristics in the next 24 – 48 hours and develop. No impact to the continental United States or Canada is expected but it could bring some rain and winds to the Azores over the next few days. October marks the 2nd most active month for hurricanes in the Atlantic. However, the winds begin to shift and waters begin to cool in preparation for fall and winter. Instead of hurricanes forming out in the opening Atlantic they begin to form closer to land where the waters are warmer, particularly in the Gulf of Mexico and the Caribbean. 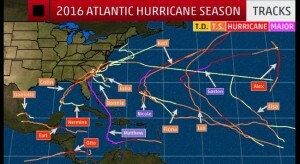 Instead of hurricanes traveling in a predominant east to west fashion as seen from June to September the trade winds shift and push hurricanes west to east. However, this poses a problem to Gulf Coast residents and especially Florida. Now that the Caribbean and the Gulf of Mexico are the main areas to see hurricane formation these storms are then pushed into land, primarily Florida, quite often. October has just begun and Hurricane Season is not officially over until November 30. We still have a long way to go, and with the active season we have been experiencing we should not be surprised to see a few more hurricanes develop. We need to continue to be prepared especially the Gulf Coast. Nate is rapidly intensifying as it approached the Gulf Coast states in the next few hours. Expected to make landfall as a Category 2 but we cannot rule out further intensification. We need to be prepared for anything, this is what the 2017 Atlantic Hurricane Season has been teaching us. These are the final hours to prepare. Another Category 5. Enter Hurricane Maria. You read that right. Another Category 5 Hurricane is spinning in the Caribbean tonight. It has been a wild September to say the least this year with many records being broken both in activity and individual cyclone strength. Last week we were dealing with Hurricane Irma impacting the Caribbean and Florida. Additionally it seemed like we were surrounded by hurricanes in the Atlantic Basin. In addition to Irma we had Jose and Katia to be concerned over. This week the trend continues. 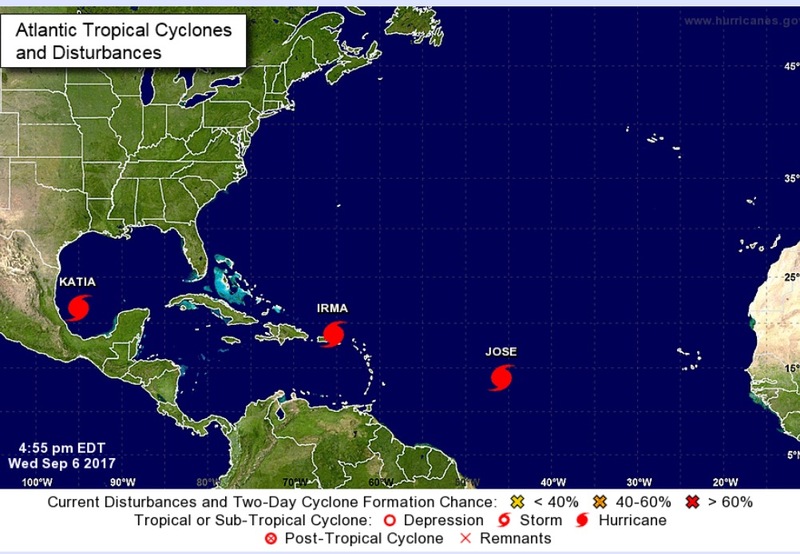 Three storms: Jose (yes, still surviving), Maria, and Lee. A busy month and constantly being surrounded by these tropical systems and we are only in the month of September. We still have October and November to deal with for the Hurricane Season. It’s insane to think how active this season is becoming. 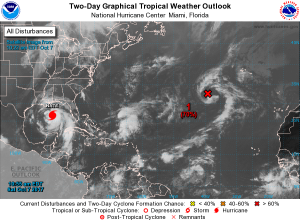 We now have has two hurricanes that have reached maximum Category 5 status. The last time that happened was in 2007. However, we cannot say that we were caught off guard this year. The National Hurricane Center and other meteorological agencies warned of an above normal hurricane season partly thanks to the mild winter North America experienced and the La Niña event in the eastern Pacific. Round two for the Caribbean, in particular the Leeward Islands and Puerto Rico. Over the past week we have been keeping our eyes on two tropical systems coming off Africa’s west coast for the potential to develop. Just like following in Irma’s footsteps the two wave quickly developed into Maria and Lee. 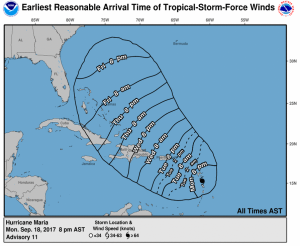 Thanks to Maria cooling the waters and harnessing the energy from the warm ocean waters and the minimal wind shear atmosphere it left Lee with very little chance to develop. 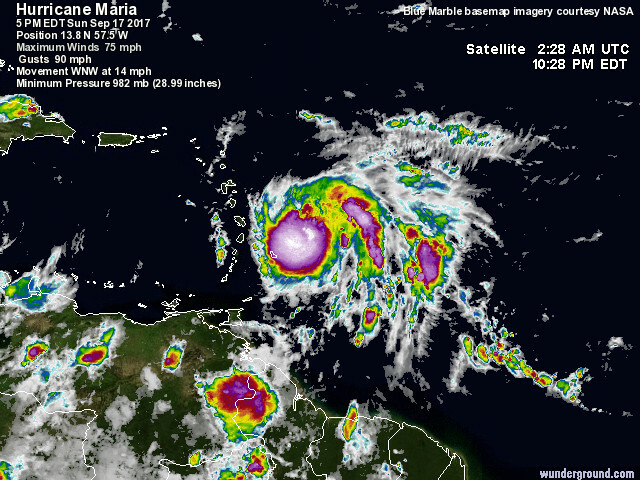 Lee is quickly dissipating right behind Maria and will pose no threat to land. 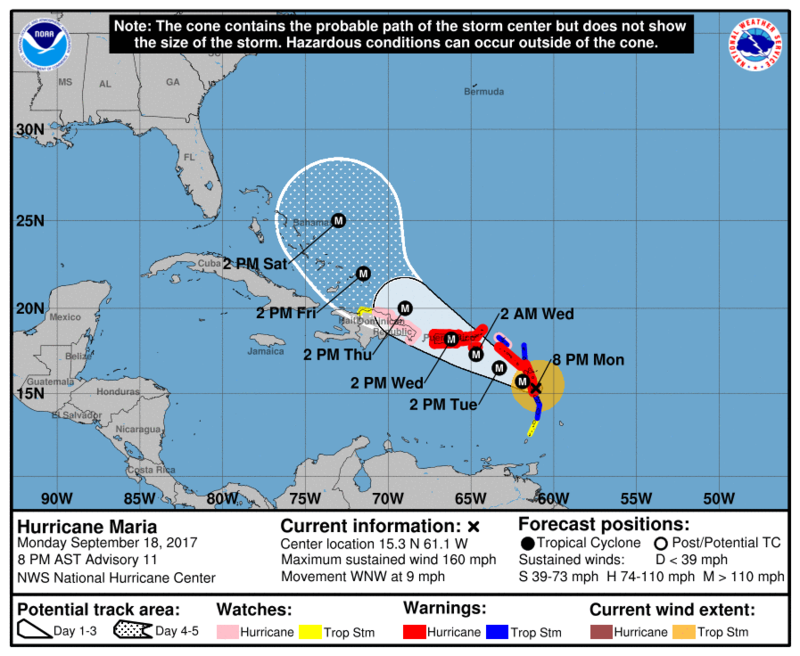 Maria continued on its track westward towards the Leeward Islands strengthening steadily. Rapid intensification took place and within a 24 hour period Maria went from a “weak” Category 1 hurricane to Category 5. Wow. Pause for a moment and just try and put yourself into the shoes of the residents on the Leeward Islands. 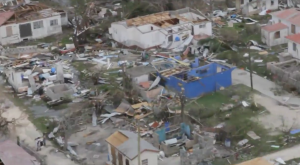 First they dealt with Category 5 Irma and the massive destruction that took place to the northern Leeward Islands of Barbuda and Antigua. Now, three islands to the south of Barbuda, the island of Dominica is receiving a direct hit from Irma. 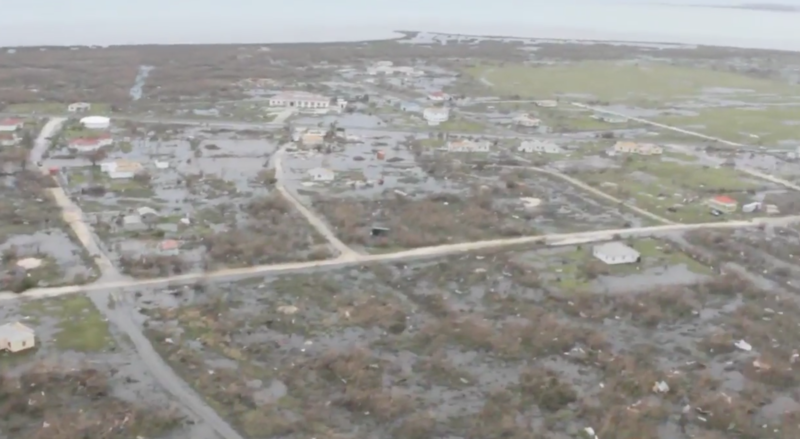 Structures on these islands have already been damaged and basic necessities such as water are difficult to come across. One Category 5 hurricane is bad enough, but to have two hit the same geographical area in about a week apart, is mind blowing. 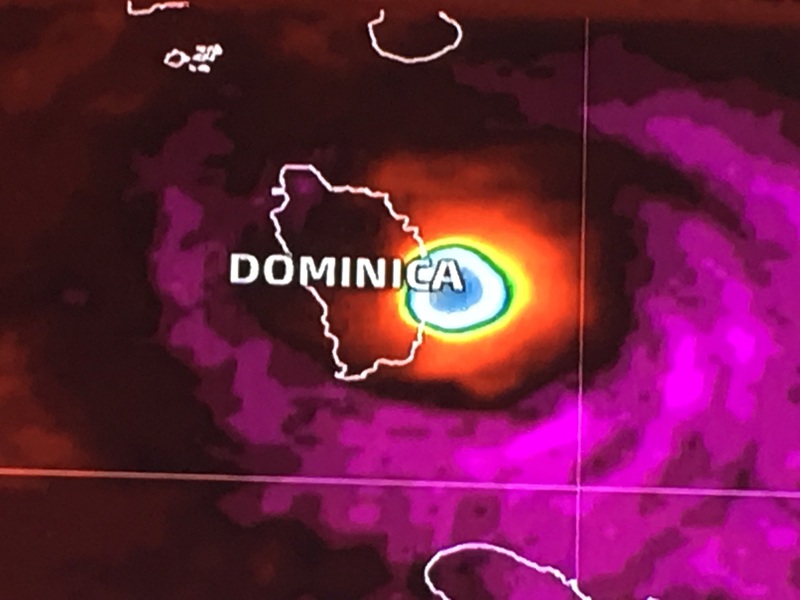 If there is any good news with this direct impact it is that Dominica is a mountainous island compare to Barbuda which suffered the direct hit from Irma. While a small island does very little to affect the storm and cut it off from its energy source it can disrupt the eye of the system. There is a slight shift and wobble in the eye of Maria as she is passing over the island, while it will not weaken the storm it still shows how mountainous regions affect these storms. However, to the residents on the island a mountain may be the best source of protection against the powerful winds that are likely gusting above 200 mph. Barbuda was a relatively flat island and therefore there was very little shelter from the powerful winds when Irma came across. 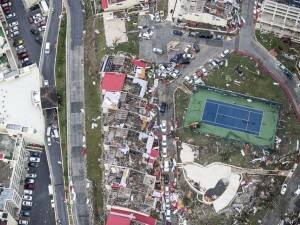 Those powerful winds destroyed an estimated 95% of the structures on the island and several days later the entire island was evacuated to the island of Antigua because of how extensive the damage was. 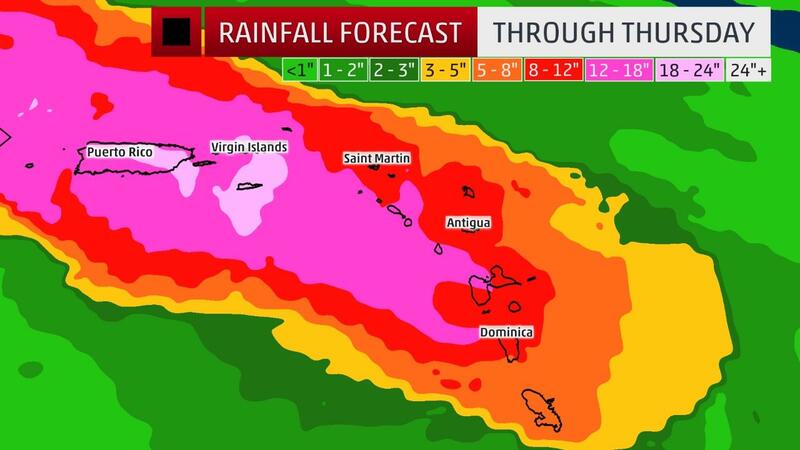 Dominica has a better chance and people are likely using the mountains to their advantage to avoid the powerful winds. However, because they received a direct impact, they will be experiencing winds from all directions as they punch through the eyewall. The next stop on Maria’s long journey is Puerto Rico where islanders have been scrambling to prepare. 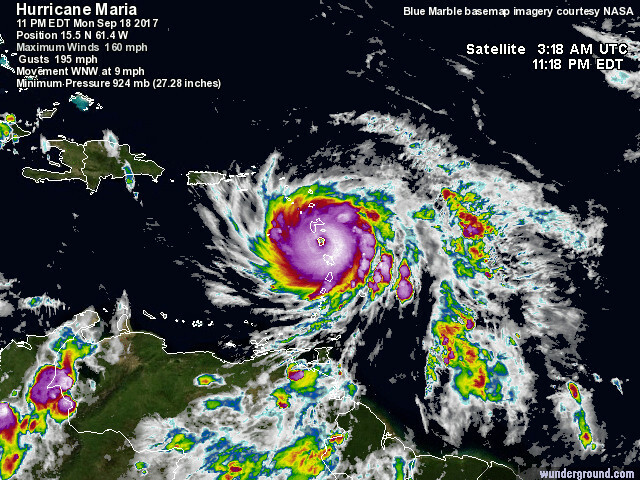 If Maria holds its Category 5 strength and impacts the island, it will be the first time Puerto Rico received a direct hit from a Category 5 hurricane in 89 years. Direct hit or not, Maria is going to come so close to the island that residents will likely experience the extreme hurricane gusts in the eyewall that are over 200 mph. Puerto Rico was spared for the most part when Irma passed just to the north of the island however, extensive damage was still reported around the island, particularly to the North. 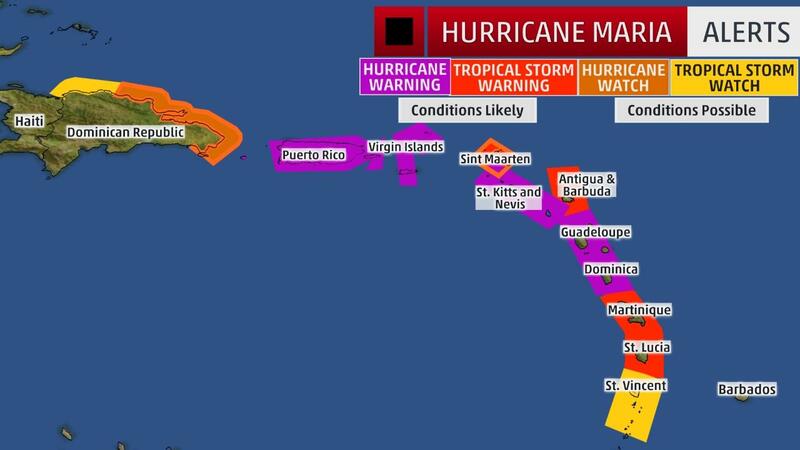 Similar to the Leeward Islands, Puerto Rico is already dealing with the cleanup from Irma and trying to get back on their feet, now here comes Category 5 Maria. It’s a tense and serious situation to say the least. The “good” think about Puerto Rico is the close connection to the United States. 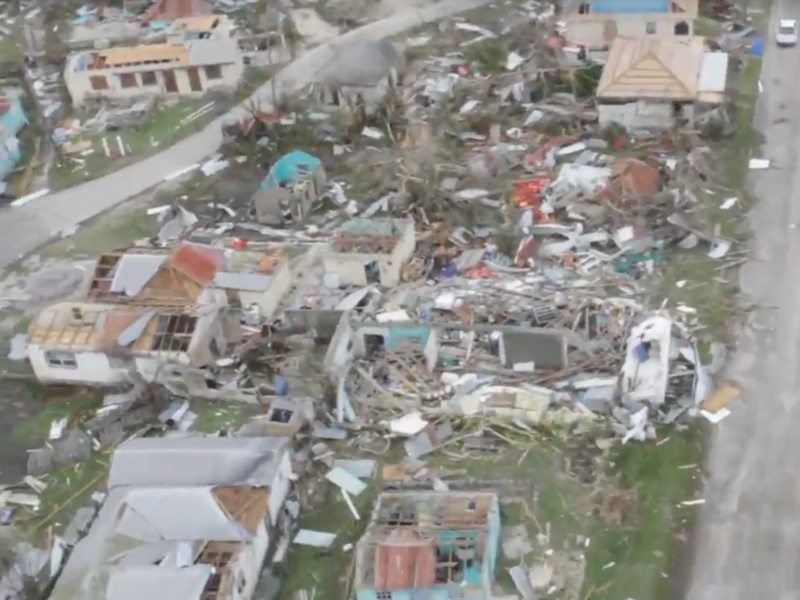 The island has strong structures in place that can withstand extreme winds and resources and aid are distributed immediately to the island nation from the United States. Extra flights have gone in to evacuate as many people as possible to take them away from the storm as well. However, time to prepare is coming to a close. 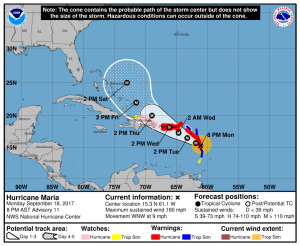 Maria is moving off the island of Dominica and exiting into the Caribbean. The next destination she has her eye on is Puerto Rico. 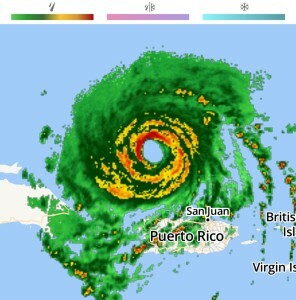 Over the next few hours the island will start to experience the extreme outer bands of Maria. Rain showers will start to saturate the mountainous island. 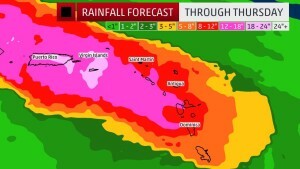 The main hazard to watch out for will be mud slides and flash floods in the mountainous areas of the island. Puerto Rico is very prone to these hazards especially with a massive amount of rain. Puerto Rico will likely receive over 18 inches of rain from this event which will cause unstable slopes in the mountains and possibly trigger mudslides during and after the hurricane. Regardless, Puerto Rico is in the direct path of Maria and will start experiencing tropical storms force winds and the heavy rain in the next few hours. Hurricane Hunters have been out monitoring Maria for the past couple of days to determine the maximum wind speeds. There is a chance that Maria will slightly weaken before reaching the island. However, Category 4 or Category 5 it makes no difference. These type of winds produce catastrophic damage to structures regardless. Additionally, Hurricane Hunters are finding evidence that the storm is even strengthening a bit more due to a lower pressure. When the barometric pressure begins to lower this is an indication that the storm is becoming stronger. Wind speeds are slightly delayed but eventually catch up with the pressure and strengthen. Unfortunately we could all be waking up tomorrow to see Hurricane Maria be very close to the power of Hurricane Irma (maximum wind speed of 185 mph). We hope this will not happen for the sake of the islands and especially Puerto Rico, but it is a real possibility. Irma continues to be a powerful Category 5 hurricane and has now remained at this strength for almost 48 hours. This breaks the record for maintaining Category 5 strength over a period of time without weakening. All eyes are on this monster hurricane as it churns through the Caribbean. 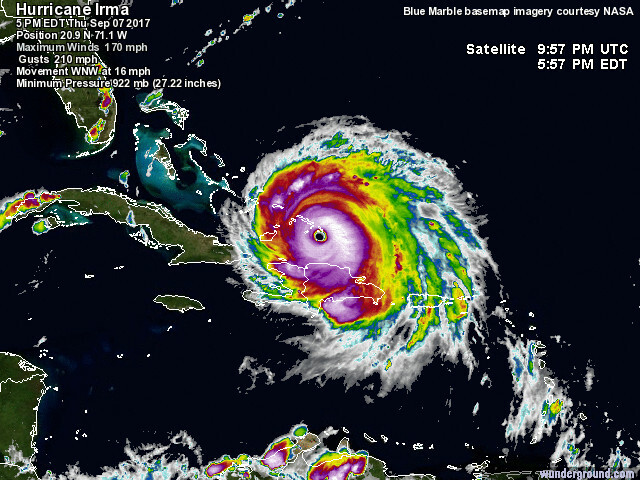 Irma reached it’s peak strength on September 6, 2017 with wind speeds of 185 mph (close to 300 km/hr) and a central barometric pressure of 916 mb. While Irma is not the strongest hurricane ever seen in the Atlantic Basin it does rank in the top 5. Based on wind speed alone the strongest hurricane was Hurricane Allen (1980) with maximum sustained winds of 190 mph; and based on lowest barometric pressure Hurricane Wilma (2005) takes the gold with a pressure of 882 mb. So while Irma has not met or surpassed these values it is still a rare and formidable storm that is already leaving a historical mark across the Caribbean and now taking aim at the United States. The first stop on Irma’s long journey across the Tropical Atlantic was the tiny island of Barbuda in the northern part of the Leeward Islands. Reports are still coming in on just how bad the situation is on this tiny island. As of this blog there is miraculously only one confirmed death on the island. 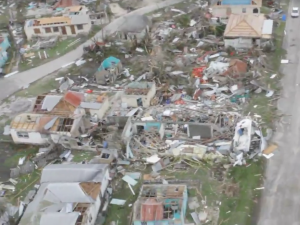 However, it is estimated that 90% of the island’s infrastructure is destroyed. This is bad news now that major Hurricane Jose is closing in on this island now. Due to the very small size of the Caribbean Islands they do not help slow down or weaken Irma or any hurricane. In order for a hurricane to weaken they need to either enter into an unfavorable environment (such as cooler waters or intense wind shear) or they need to come ashore which will cut it off from the energy source of the oceans. These islands do not block out the water energy source hurricanes need to continue to evolve, and this is why Irma has been maintaining so much strength at she pushed through the small island chains. The only hope for Irma to weaken slightly on its track towards Florida is if there is a track shift to the south where Irma could interact with the harsh mountainous islands of the Dominican or Cuba. Unfortunately we are not seeing this happening. Each model takes into consideration different atmospheric phenomenons and how fast these components are moving and how they will affect the path and intensity of a hurricane. We usually focus on on the American (GFS) and the European model when it comes to tropical storms in the Atlantic. These models tend to be the most advanced and typically correct for hurricanes that form in this ocean basin. However, they do differ often, especially when looking at a far out forecast (more than 3 days). We know that Irma is going to turn north once it reaches Florida, but we do not know when, and this is crucial. There is a good news scenario and a bad news scenario for these models. The best case scenario is that Irma turns sooner and travels up the east coast of Florida keeping the damaging eyewall out at sea. 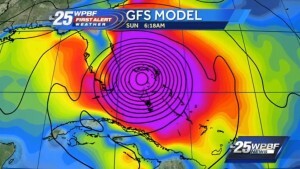 This will spare the populated city of Miami a direct hit and keep the strong hurricane force winds off the shore. The worst situation would follow the European model which shows Irma impacting exactly the Homestead and Miami areas bringing the damaging eyewall right over land. Also note, we are still expecting Irma to be a major hurricane, possibly a Category 4 but we cannot rule out a Category 5. 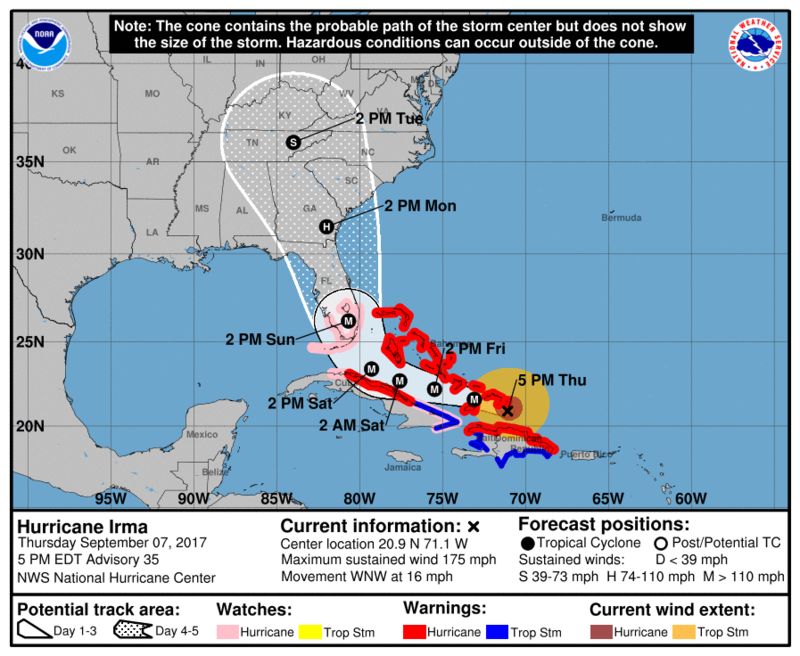 (Left: cone of uncertainty and the strength of Irma at given times – Courtesy Weather Underground. 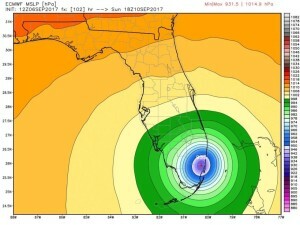 Right: potential pathways Irma could take). Additionally, we should not be surprised if Hurricane Irma turns late and instead enters the Gulf of Mexico. While models are starting to agree that the east coast of Florida will likely see the brunt of this storm we cannot rule out the possibility of the west coast being impacted. 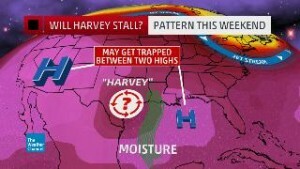 Meteorology is probably the most complicated science, and this proves the point. Regardless of where Irma will track, Florida is a very thin state and Irma is a large storm and continuing to grow. Therefore, even if Irma tracks up the east coast of Florida, the west coast will see some major impacts in the form of tropical storm force winds, heavy rain, and even some wave action along the coasts. It does not matter at this point where Irma will go, because the entire state will receive impacts from Irma. 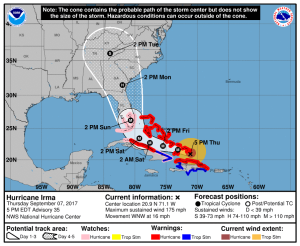 Florida has been under a State of Emergency for all counties and is taking action immediately for this fast approaching storm. 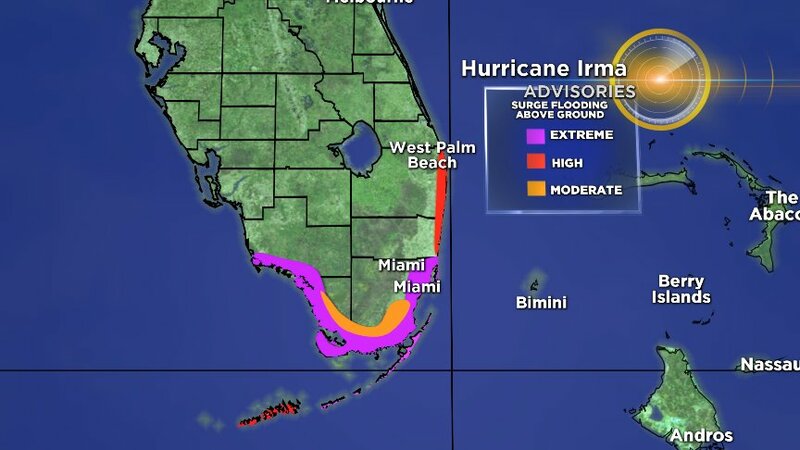 The Florida Keys are under a mandatory evacuation and the Miami-Dade area has been issuing evacuation orders all day. A hurricane watch was issued by the National Hurricane Center this morning for South Florida and extending upwards towards Jupiter, Florida. These watches and even warnings will continue to extend up the east coast in the next couple of days. 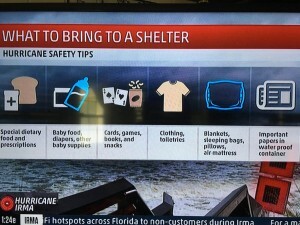 Here is what you need to know if you are in South Florida: if you are under an evacuation order, leave. This is a serious situation unfolding and conditions will start to deteriorate fast into the weekend. The main concern for the Miami area and the Homestead area in particular is the storm surge. 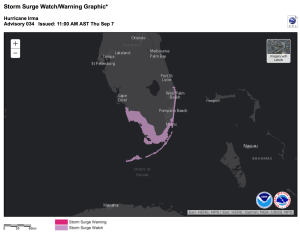 The 2017 Atlantic Hurricane Season introduced a new watch and warning map focusing on potential storm surge for the United States coastlines. Currently watches extended for the Florida Keys and encompassing all of southern Florida. These watches will change to warnings as Irma comes closer. South Florida, particularly the Miami and Homestead area is unique due to the barrier islands. Unfortunately these tight clustered barrier islands act as a trap for storm surge. Once the surge enters this area it has nowhere to go but inland and this is why the situation in this particular spot is so dire and why people need to evacuate as soon as possible. 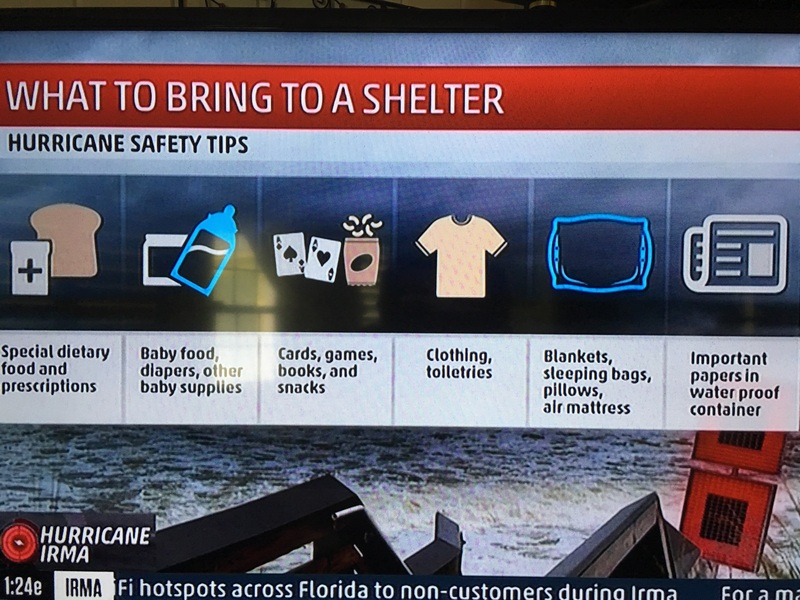 Make sure you stock up on the basic essentials, especially if you plan to stay in your area for the storm. Bottled water (1 gallon per person per day) and also enough for your pets. Non-perishable food items. Keep in mind power might be out for days after the storm. You will not be able to heat anything. Also make sure you have a manual can opener to open some of these food items. Peanuts and canned beans are great sources of protein and will give you and your family strength. Also paper goods. Pets! Do not forget you pets! They need extra water and food as well. Do not leave them behind. Numerous shelters are up across Florida that will keep your pets safe. Additionally, hotels are waiving pet fees and allowing pets to stay if you choose to evacuate to an inland hotel. Extra medicine and an emergency medical kit. Make sure you have extra medication and enough for a few weeks in case you cannot get back into the area impacted. 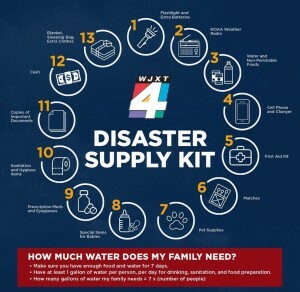 Also consider a medical kit in case of injury during the hurricane or during the evacuation process. Batteries. 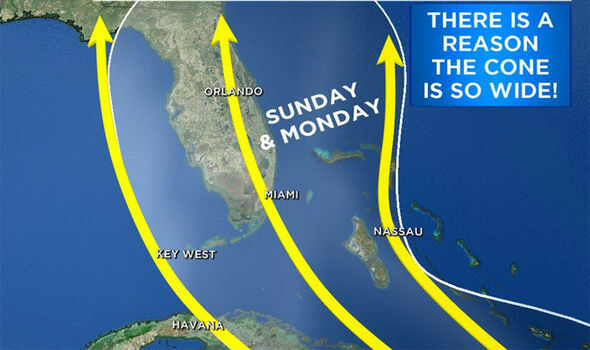 Once more, electricity will be out for most of Florida, especially South Florida. Stock up on power banks and make sure they are charged before power goes out. Also a NOAA battery operated radio to give you up-to-date information regarding the storm. If your phone dies you will be cut off from social media. You want to have something that will inform you of the outside situation. These radios are sold in a variety of stores including grocery, Walmart, Target and Home Depot. Cash. Go to the ATM and take out enough cash especially if you are evacuating. ATM’s will be down for possibly many days after the storm has passed. You want to make sure to retrieve enough cash to help you and your family evacuate or even to survive on in the coming weeks. Food and Water. Businesses are closing and you will likely not be able to stop on the side of the road and eat. Additionally, not all shelters have food for you. Be prepared to bring your own food. Supplies for your children: baby food, diapers, bottles, toys. You want to make the children feel safe during this time. A favorite toy or blanket will help keep them calm especially in a shelter. They are just a scared as you are, try and remain calm yourself. Games for you and your family. Being in a shelter is long, hot, boring, and tiresome. You want something to take your mind off of the situation. Bring some cards, books, and other entertainment supplies. Clean clothes and blankets and pillows. Make yourself comfortable and keep clean because you will be away or in a shelter for a long period of time perhaps. VERY IMPORTANT: bring documentation. Government ID’s and Housing deeds or electrical bills to prove that you live in your area when the time comes to go home. Many areas will not let you back home unless you have these documents. Anything important to you and your family. Old pictures, maybe a wedding dress. Things that are very important to your family that you want to protect. Currently the Turks and Caicos are feeling the full force of Irma with possible storm surge values reaching 20 feet! As of the 5 pm advisory from the National Hurricane Center Irma remains a strong Cat. 5 hurricane with winds slightly lower and down to 170 mph. Irma is weakening but very slowly. Regardless it is a monster storm with its eye on Florida. These models will change over the next several hours as Irma approaches the shores of the Bahamas and the United States. 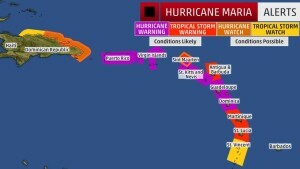 Hurricane Warnings up for north Cuba, the Bahamas, and the Turks and Caicos. 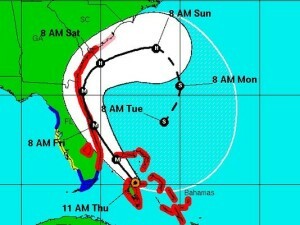 Watches remain for Florida. Bahamas to receive close to 20 inches of rain in some areas and this will likely move into Florida for the weekend especially if Irma continues to grow in size. In meteorology we never want to compare to storms because each one is unique and special with different impacts. However, sometimes this is the only way to get information across to the public. Hurricane Andrew. Andrew came ashore in the Homestead are in 1992 as a Category 5 storm. While we are forecasting Irma to be closer to a 4 if it impacts South Florida there is not much difference damage-wise between a Cat.4 and a Cat. 5. Both of these categories will do “catastrophic damage”. Andrew, however, was TINY. A very small storm that only impacted the Homestead area and avoided the Miami area. If this storm came ashore in Miami just a few miles to the North it likely would have increased the fatality rate. Andrew occurred over 25 years ago though. Since this time population has boomed across the area and now more people and property are at risk. Irma is a much larger hurricane. 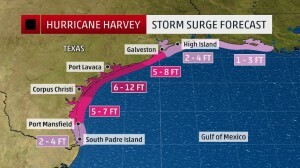 Larger hurricanes produce higher storm surge rates and more rainfall as well as intense winds closer to the eye of the hurricane. 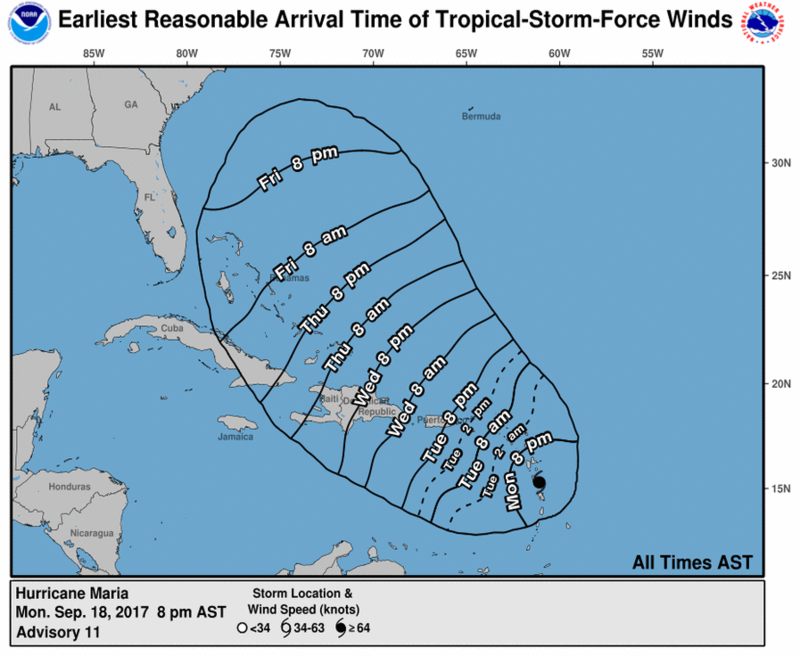 We need to treat Irma like a Super Andrew just based on its size alone. Hurricane Matthew. Matthew just happened last year in 2016 and mostly impacted the North Florida area. 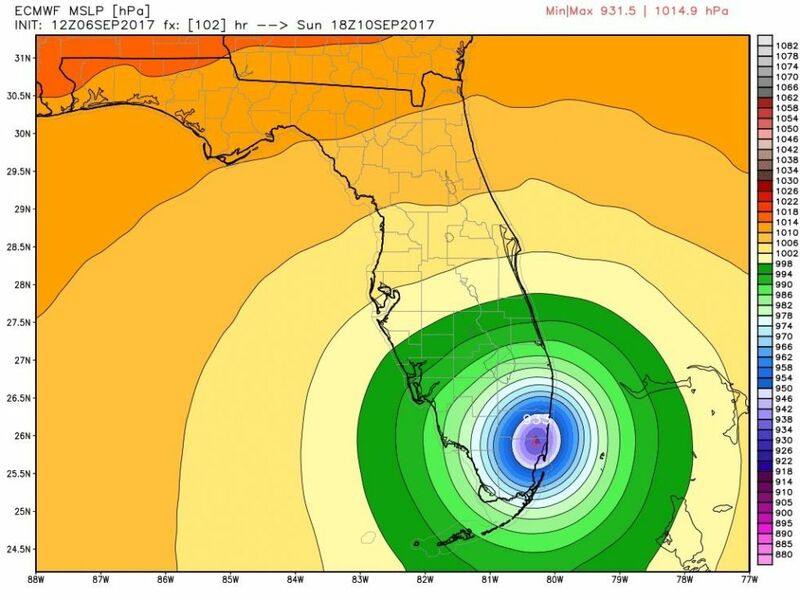 While South Florida was spared from this system North Floridians are trying to determine if Irma will be similar to Matthew. Once again, it all depends on where the eye of Irma will be once it works its way to the North Florida area. If the eye stays offshore, like it did with Matthew we will have a similar scenario with storm surge heights and rainfall for the area. Once again though every hurricane is different and each one is a different size and in a different “life stage” at the time they reach northern latitudes. Another scenario is that the eye of Irma skims the coastline all the way up North Florida. The closer that eye is to the coastline, the more severe the storm surge and the winds. Likely interacting with land will help weaken the storm considerably before it reaches the North Florida area. Regardless South Florida and the Impact Irma will have will help to weaken the storm a bit before it travels further North towards North Florida, Georgia and the Carolinas. We cannot rule out a major hurricane in the North Florida area, which is what Matthew was (Cat. 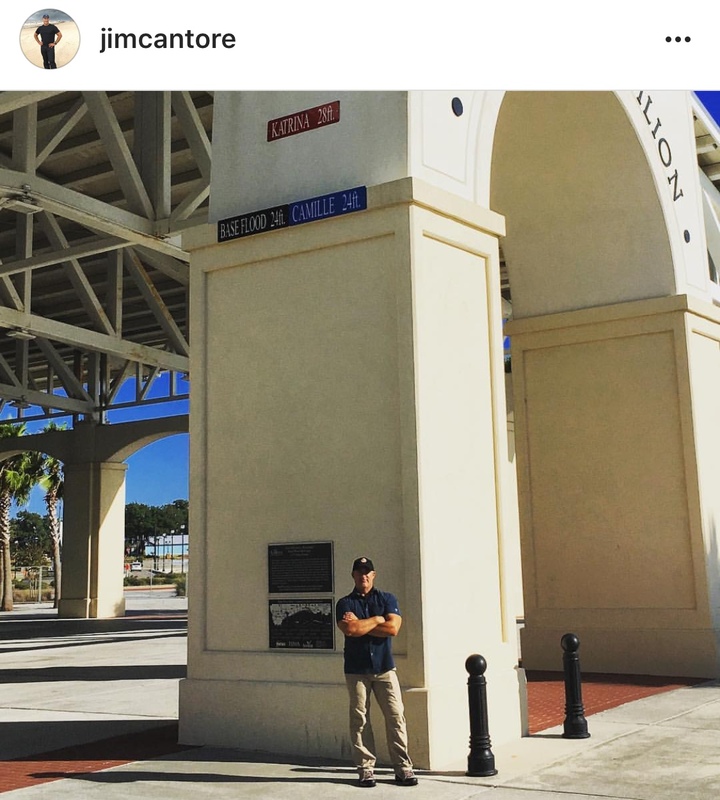 3) when it arrived in Daytona, Flagler and Saint Augustine. Weather Goddess continuing to track Hurricane Irma around the clock as the events unfold across the Caribbean. Blogs will be updated time permitting. 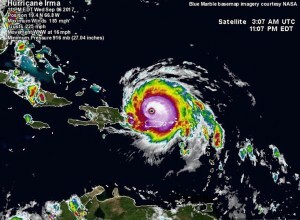 However, please refer to the official Weather Goddess social media pages for the very latest on Irma’s track, intensity, evacuation notices, preparations, and helpful hints to survive this historic storm. We must prepare for the worst, and hope for the best. Prayers to the Caribbean and Florida. 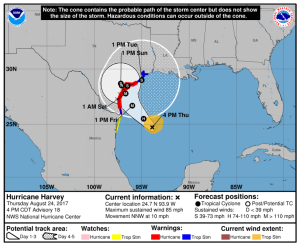 Hurricane Harvey Coming Ashore. 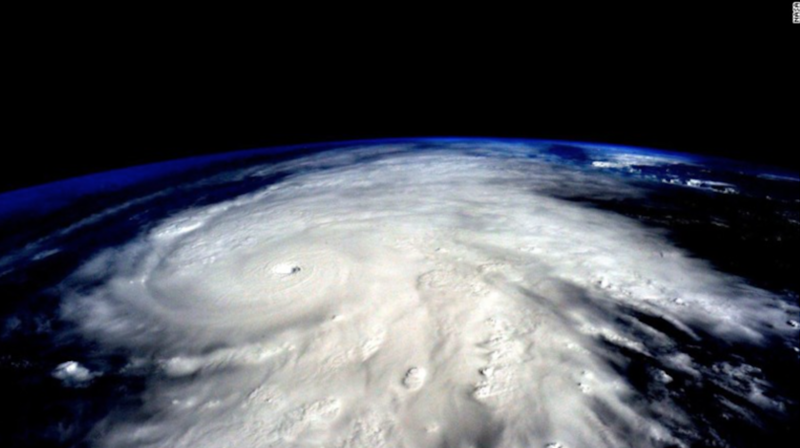 The First Major Hurricane to Impact the United States Since 2005. Harvey is coming ashore as a powerful Category 4 hurricane with winds of 130 mph and a low barometric pressure of 941 mb. The powerful eyewall is brushing the coast and the eye is expected to pass over or close to Rockport, Texas in the next hour. Over the last few hours Harvey rapidly intensified and Hurricane Hunters have determined low end Category 4 winds close to the center of circulation. Incredibly the barometric pressure is continuing to lower even though it is approaching land. 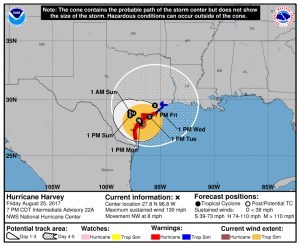 It is unlikely that Harvey will reach Category 5 status and instead will remain a formidable Category 4 as it comes ashore. The problem is the forward motion of Harvey and the effects it will have on Texas. This slow motion caused the rapid intensification of Harvey and allowed the storm to feed off the warm waters on the Gulf of Mexico. Currently Harvey is moving to the NW at 8 mph (down from 10 mph later this afternoon) and is expected to slow down even further overnight and stall over the region before being pushed to the ESE and drift towards the Houston, Texas area. This is only the beginning. A Category 4 storm is a rare and life threatening event but we have not witnessed the true strength of Harvey yet. The true threat lies with the rain and how long Harvey will be lingering in the region. Once reaching the shore Harvey is expected to linger in the area for the weekend, and while it will weaken due to the land contact, the rain will not. 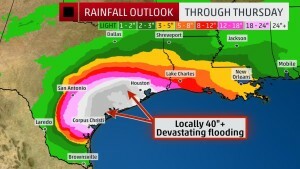 Some areas between Corpus Cristi and Houston, Texas will likely see more than 40 inches of rain. This is a staggering amount of rain that can easily leave areas uninhabitable for weeks or months. Harvey is likely to linger over the Corpus Christi area before moving off towards Houston as a Tropical Storm or possible a Category 1 hurricane. The real question becomes if Harvey will exit back out into the Gulf of Mexico early next week and possibly restrengthen as it slowly drifts towards Louisiana. The best case scenario is that Harvey remains over land and weakens. It is a double edge sword. If Harvey remains over land it will allow for more rain to accumulate, but it will also cut off the energy supply of the hurricane and allow it to weaken faster. However, if the hurricane pushes back into the warm Gulf of Mexico, we could see Harvey reform. Harvey is now coming ashore and will break the 11 year major hurricane drought record. 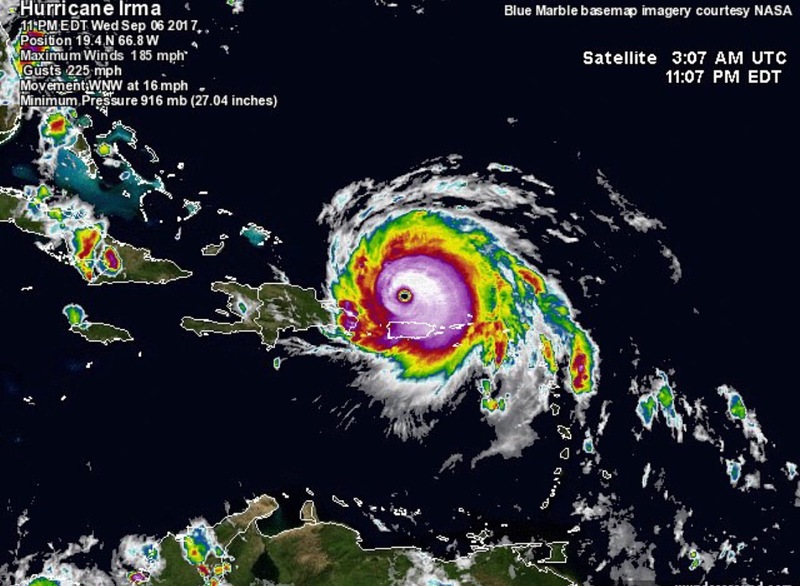 The last time the United States received a direct hit by a major hurricane was back in 2005 with Hurricane Wilma. Additionally, the last time the Corpus Christi area received a major hurricane was back in 1970 with Hurricane Celia (Category 3). 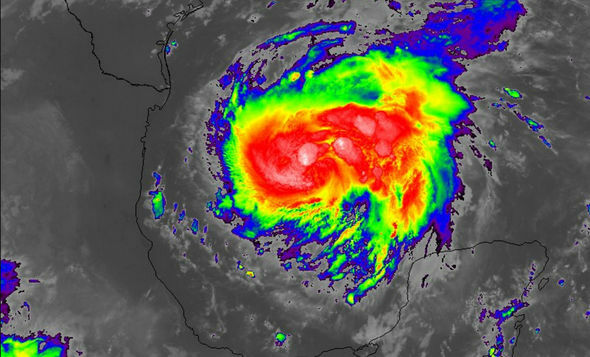 The last time a Category 4 came ashore in Texas was in 1961 with Hurricane Celia. Currently, the Texas counties of Aransas, Calhoun, Refugio are under an “extreme wind warning” which is issued when major hurricane force winds are expected. A very rare and potentially deadly warning to residents who chose to stay in this area during the storm. These counties are currently experiencing the powerful eyewall that is coming ashore and will soon punch through into the eye of the storm. I cannot stress this enough, when the eye passes over these areas it will be calm for a brief few minutes before the backside of the eyewall impacts the area again. Stay indoors, do not venture out, wait until the storm has fully passed before going out and assessing the damage. The time to evacuate has passed. The best thing to do is to stay where you are and ride out the storm. Storm surge continues to batter the coastline particularly to the areas east of Corpus Christi. 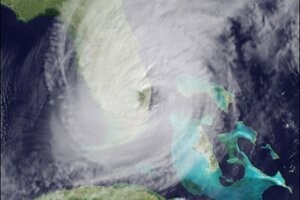 Generally the most powerful storm surge and winds are found to the northeast of the eye. The Texas areas of Lockport, Aransas and Port O’Connor are at the most risk for the storm surge and hurricane force winds exceeding 130 mph. 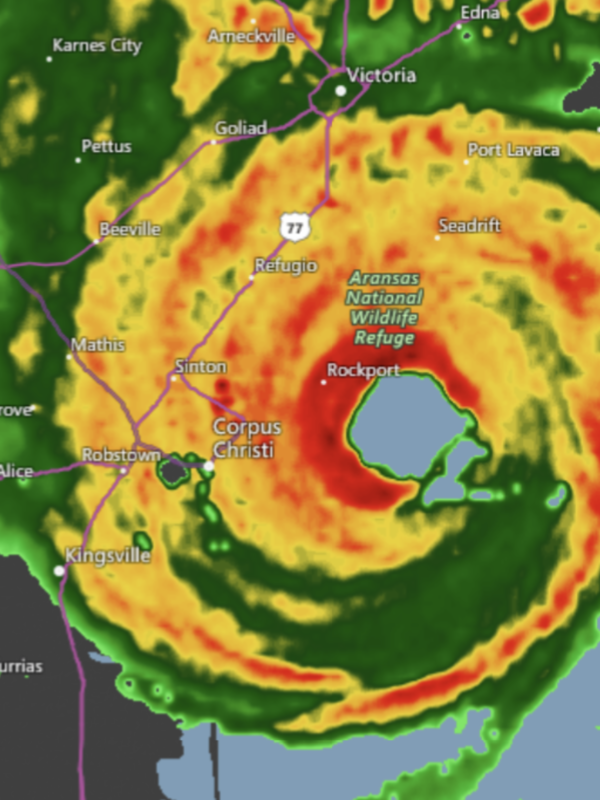 Port Aransas has so far recorded a wind gust of 125 mph and is taking the full force of the hurricane force winds as the eyewall starts to come ashore. Additionally, tornado warnings have been issued throughout the day as the outer bands from Harvey work their way inland. The tornado threat continues overnight and extends far from the eye of Harvey. Expect power to be lost overnight and storm surge and high winds to continue throughout the night. Without a doubt it will be a long and loud night for those in Harvey’s path. 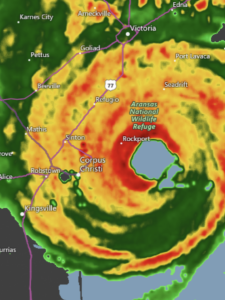 Hurricane Harvey, a powerful Category 4 storm is now coming ashore near Rockport, Texas. This is only the beginning. This is not a coastal event, it is also an inland event as well. Be prepared to see Harvey linger for the next few days and bring record amounts of rain to southeast Texas. Harvey will likely be a storm for the record books. Hurricane Harvey is here Texas! 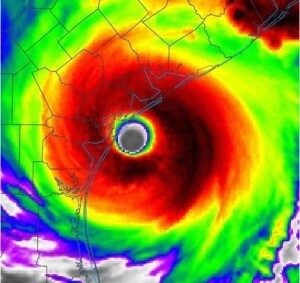 Worst Possible Situation Unfolding with Hurricane Harvey. Evacuations Underway. Harvey has been a storm that refuses to die. Starting out as a Tropical Storm that was approaching the Yucatán Peninsula about a week ago before it weakened back to a tropical wave. However, once entering into the Gulf of Mexico, Harvey reclaimed its name and rapidly intensified into a Category 1 hurricane. Harvey is continuing to strengthen as it’s forward speed begins to decrease and it meanders over the warm waters of the Gulf of Mexico tracking slowly to the northwest. The worst news to report is that Harvey is expected to continue its strengthening cycle and quickly evolve into a major hurricane prior to landfall. Harvey is quickly becoming more compact and beginning to show an eye forming near the center of circulation indicating a strengthening pattern. Without a doubt, Harvey will strengthen and has a great possibility of becoming a major hurricane, reaching Category 3 status before it makes landfall overnight Friday along the coast of southeast Texas. High pressures tend to steer low pressure systems (such as hurricanes) away and can even block tropical cyclones from moving around very much. These two high pressures are the key reason we should be fearing Harvey. While the fact of dealing with a possible Category 3 system may sound frightening, try imagining a hurricane of this strength near stationary over land. This is the worst fear we currently have with Harvey and why it may become a very deadly storm. Harvey is continuing on a northwest track and moving at a fairly slow speed of around 10 mph. This will slow even more in the coming hours before making landfall along the Texas coastline. Additionally, by early next week Harvey could become stationary over Texas. Models are in agreement on the forecasted direction Harvey will likely take thanks to the presence of the high pressure systems on either side of hurricane. 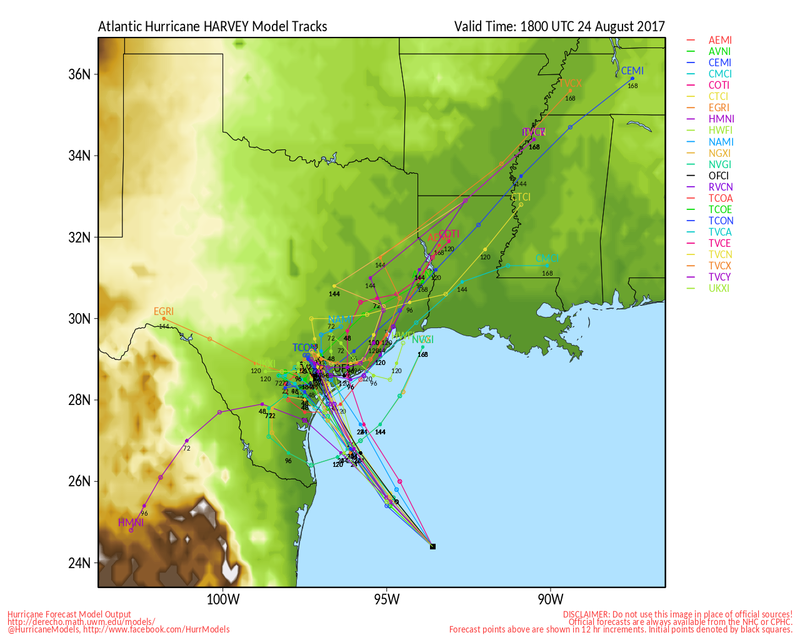 Models are showing that Harvey will impact the coast of Texas Friday night into Saturday and then begin to stall and drift slowly over the coastline and inland. By early next week Harvey could be situated over Louisiana. 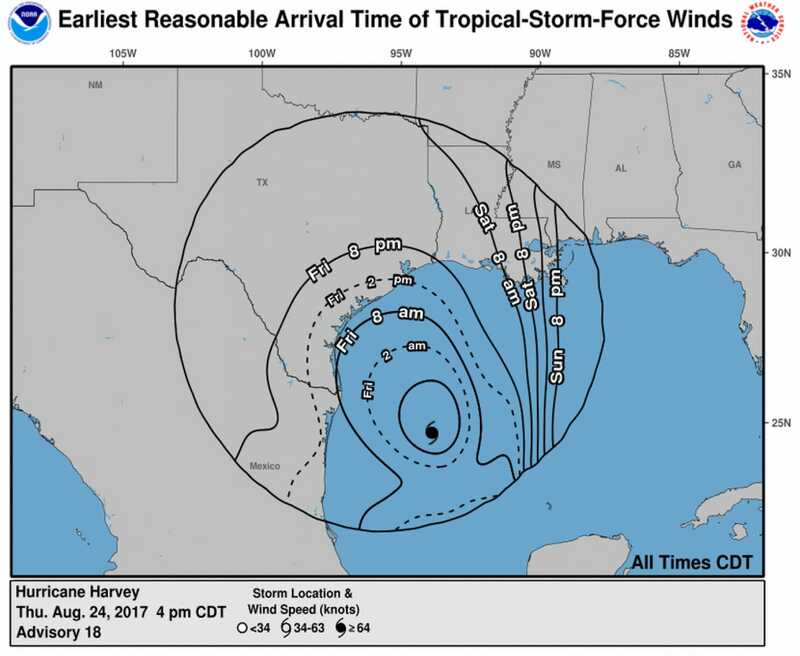 Once the Texas coast has been impacted is when the true power of Harvey comes to light. 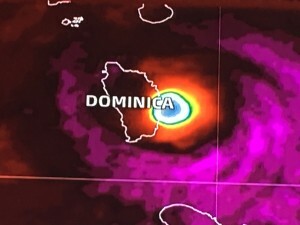 Those who have experienced hurricanes are used to experiencing the effects of these storms for about a day or less before the storm moves away from the impacted area. With Harvey, however, Texas could be experiencing the threats from this storm for days thanks to the high pressures that are blocking the storm. 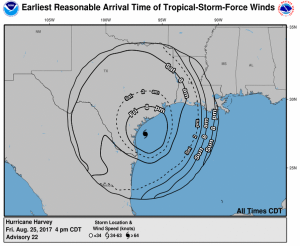 The real question becomes: will Harvey stall offshore or over land? This could be a game changer in many ways. Regardless, tremendous and historic rainfall amounts could take place with Harvey both on the coast and far inland. However, if Harvey stalls over land it will weaken faster compared to if it stalls over water. The ocean is a fuel source for hurricanes and depending on the sea surface temperatures and upper level wind shear levels, a hurricane will continue to maintain its strength while over the ocean. This is the worst possible scenario for Texas. Coastlines could experience heavy rainfall that can last into early next week and storm surge that could continue for many hours or a couple of days if the center of low pressure remains offshore. The environment that Harvey is currently in is prime. Not only are the waters of the Gulf of Mexico warm but the atmosphere is harboring very little wind sheer in the area. These two factors indicate that Harvey will continue to grow and strengthen and possibly become a major hurricane overnight before it comes ashore tomorrow night and into Saturday morning in Texas. The time lapse animation above shows thunderstorms popping along the northeast side of the storm (generally the area which experiences the most rain and storm surge activity) and is slowly spreading around the center of circulation which indicates that the atmosphere is very unstable allowing for these thunderstorms to pop close to the center. A weakening storm would not show these cloud tops forming around the eye wall. It is also evident that an eye is trying to peak through the clouds, another sign that a hurricane is intensifying. Discussing the threats with Harvey. First is the time frame. A week ago we were tracking Harvey down in the Caribbean and the potential threat it could pose to the Yucatan Peninsula. Residents in that area had ample time to prepare for the storm. However, Texans are literally preparing for the worst situation in a very brief amount of time. Originally forecasts and models did not pick up on Harvey strengthening into a possible major hurricane (category 3 and higher). 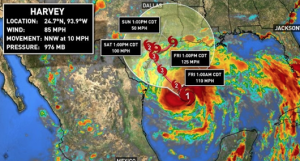 Many locals did not pay much mind to the storm approaching until today when models and updated forecasts started to pick up on intensification, leaving Texans with very little time to get ready and evacuate. The extreme outer bands of Harvey are already bringing showers to the coastlines and this rain will continue to get worse, especially throughout the day tomorrow as Harvey moves closer. 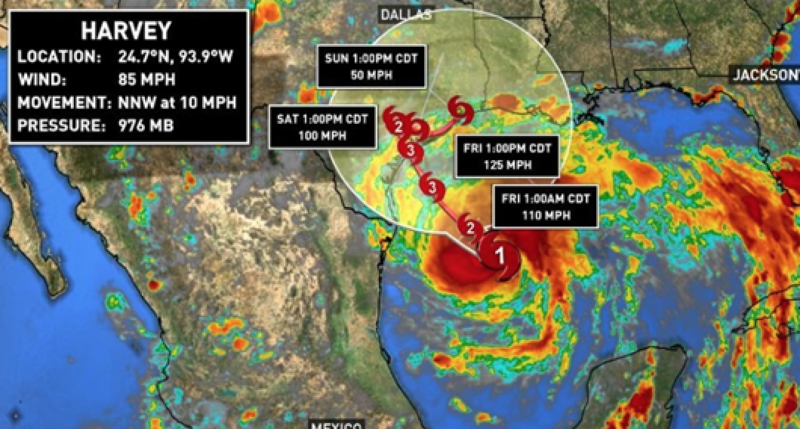 Texas in under a state of emergency and evacuations have been ordered especially along the coastlines. Emergency personnel are encouraging people to leave and go further inland. 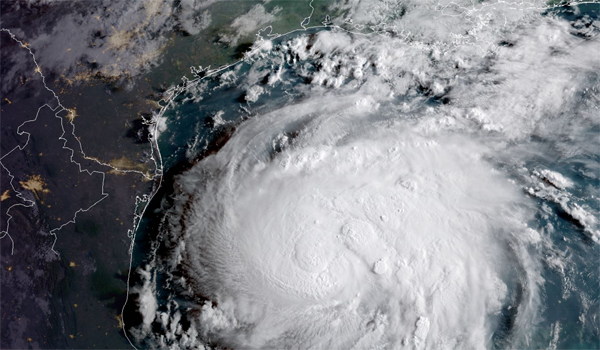 The last time Texas was impacted by a Hurricane was in 2008, and many people remember that particular storm: Hurricane Ike. We can easily see a repeat of Hurricane Ike with Harvey. 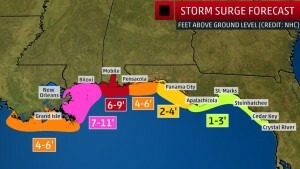 Storm surge will be a main threat and one of the deadliest components with this system. 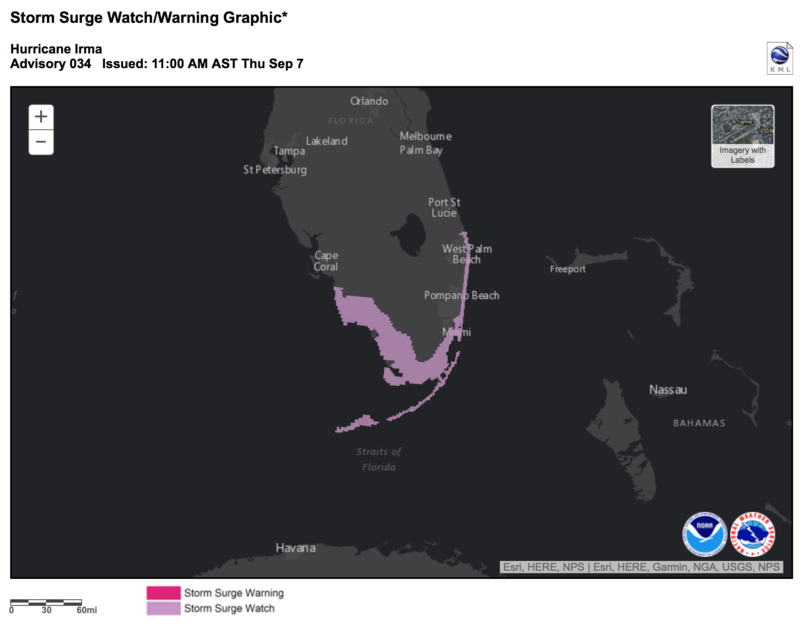 As of this year the National Hurricane Center is introducing storm surge watches and warnings for coastal areas that are threatened by tropical cyclones. 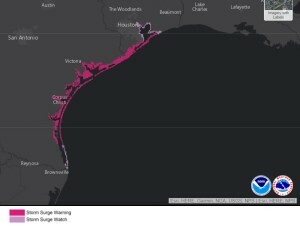 The majority of Texas’ gulf coastlines are under a storm surge warning with forecasted heights reaching up to 12 feet. This is an easy repeat of the storm surge the Galveston area saw during Hurricane Ike. These levels will easily flood homes and trap residents if they choose to stay and ride out the storm. Unlike the east coast of the United States, which also experiences hurricanes, the states that border the Gulf of Mexico experience higher storm surge heights due in part to the geography of the Gulf of Mexico. Once a hurricane enters into this area, it has nowhere else to go and pushes water ahead of the direction the storm is moving. The water continues to move further and further inland having nowhere else to go. This is why the greatest storm surge amounts were seen in hurricanes such as Katrina (2005) and Ike (2008). Harvey will likely be a hurricane that produces this kind of storm surge. 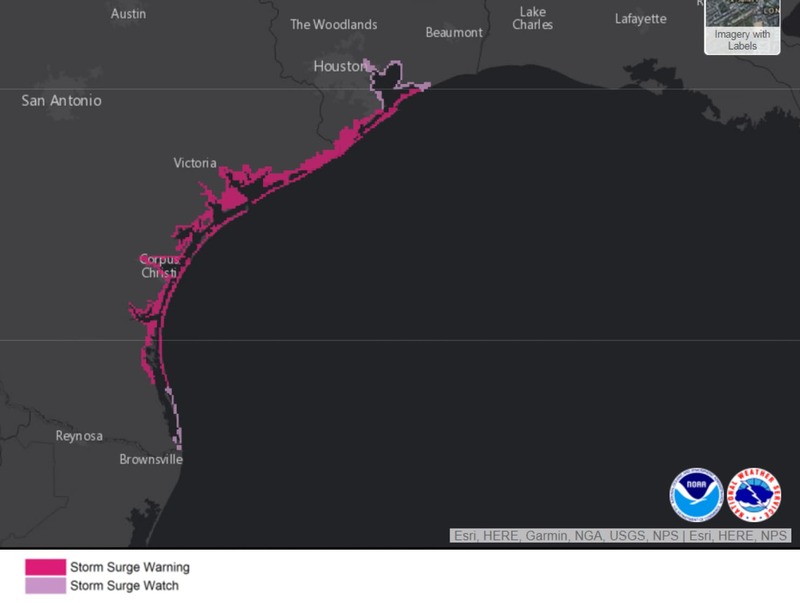 This alone should be evidence that residents need to evacuate along the coastlines of Texas and not risk staying. The worst of the storm surge will be located primarily to the northeast of the eye wall which is expected to be east of Corpus Christi, Texas. Again, due to how slow Harvey is moving, areas can likely experience storm surge that can last a day or more. Emergency personal will not be available to help you until after the storm has passed or it has been deemed safe to start rescuing people. Those who choose to stay can likely expect to be trapped in their homes for days. The other concern with Harvey will be the tremendous amount of moisture. 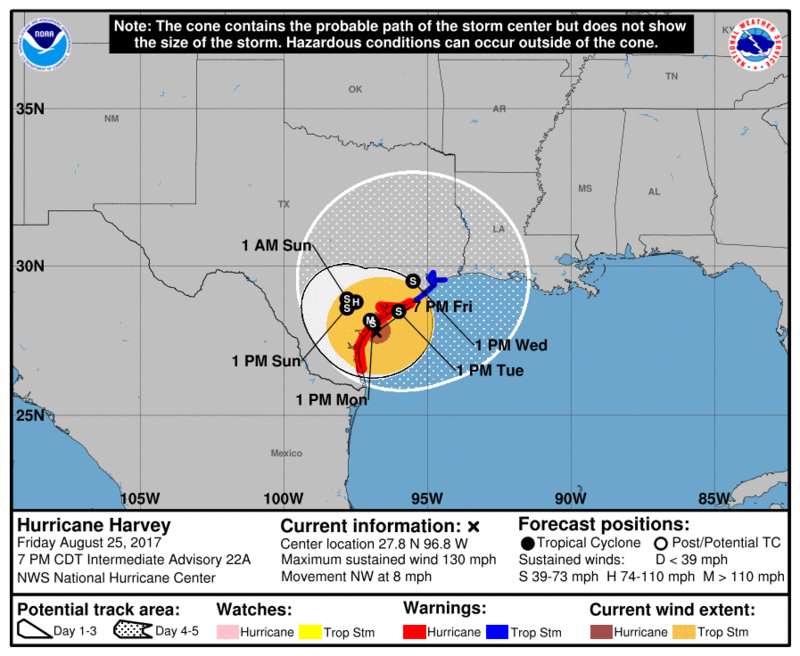 Thanks to its slow speed Harvey will be lingering over Texas and Louisiana into next week before moving off to the east or weakening. This will in turn bring significant and possibly historic rainfall amounts to numerous areas. 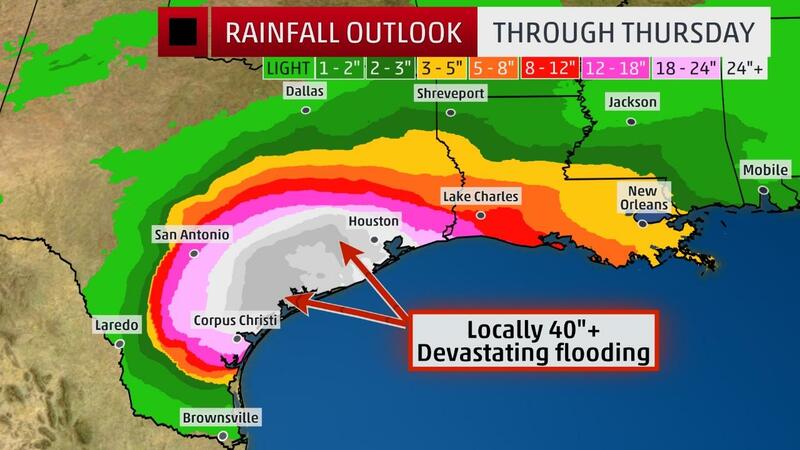 Over the weekend Texas will see the majority of the rain from Harvey with some areas easily reaching over 15 inches of rain as Harvey moves ashore. Early next week Harvey will begin to drift slowly to the east and into the Louisiana area and will likely produce a major flooding event for areas that were impacted by Hurricane Katrina back in 2005. It is important to note that Harvey is not going to be a coastal event, but it will also be an inland event. Streams and rivers will back up due to the storm surge and the immense amount of rain and cause widespread flooding far from the shorelines. Harvey will not be a storm that affects one small area of Texas. It will threaten the majority of southeast Texas and spread into Louisiana and Mississippi even by next week. The fault can be placed on the two high pressure systems blocking this storm. This is a worst case scenario in truth. A slow moving storm is perhaps the most deadly of components. The slower a system, the more rain, longer storm surge, and hurricane force wind duration. The main question remains on if Harvey will linger more offshore, or if it will come ashore and gradually weaken over land. Texans, especially those living along the Gulf Coast, now is the time to prepare. Do not think that you can survive this storm. While Harvey may still be a Category 1 hurricane it is apparent from Hurricane Hunter data and satellite imagery that the storm is rapidly intensifying and could very well be a major Category 3, and possibly a Category 4 hurricane, before making landfall. Those that survived and witnessed the power of Hurricane Ike should know that Harvey means business. 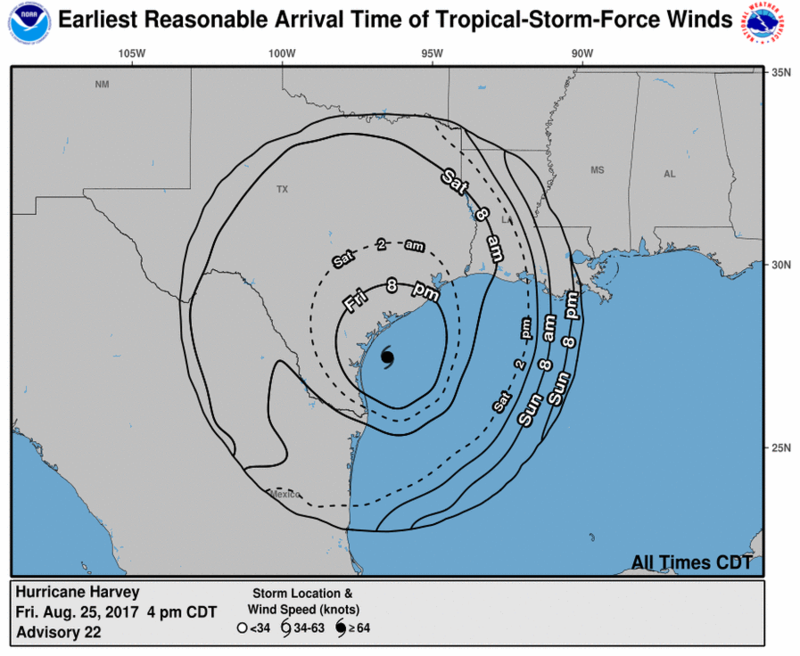 Unlike Ike, Harvey could, and possibly will, last for much longer. Severe impacts start tomorrow as the stronger outer bands start to come ashore. 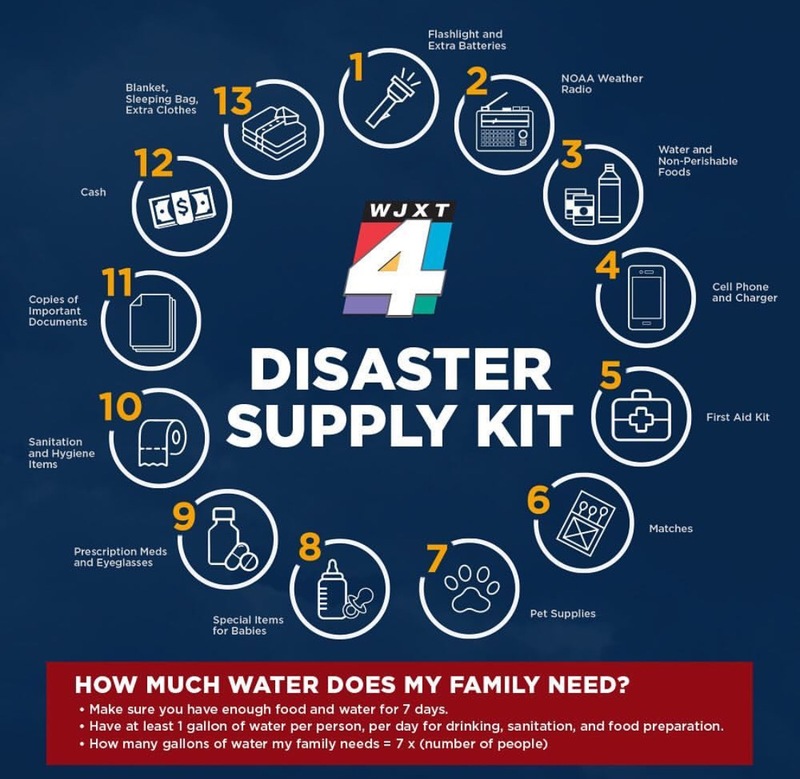 Make sure that you are prepared and gather up all the necessities that you will need to survive at least a week after the storm has passed. Non-parashable food, clean bottled water, medication. If you evacuate, make sure to bring important papers such as utility bills with your address on them so that you can return to your property once the storm has passed. Do not abandon your pets. Many shelters will not take pets but there are places offering to board your pets. If you can, bring your pets with you and locate shelters that allow them. Additionally, bring their medications and food for them as well. Check on the elderly in your area and make sure they have a place to go as well. Aid in helping your neighborhood by bringing neighbors to shelters or offering to help prepare their homes for what is likely to be a historic storm. Harvey will be the first hurricane to impact Texas since Hurricane Ike in 2008 and will likely become the first major hurricane to directly impact the United States since Hurricane Wilma in 2005. We are not dealing with a hurricane such as Hurricane Matthew (2016) which brushed the coast of Florida last year. Hurricane Harvey will come ashore and threaten many lives. This is not something that meteorologists would want to say too often, but this is a very deadly storm and should be taken seriously. If you are ordered to evacuate, do so immediately. Do not wait until the last minute. 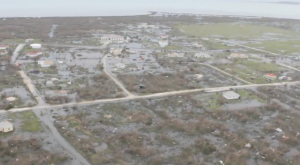 We will very likely be seeing similar scenes to what we saw in Hurricane Ike. Be prepared and evacuate if you are told to do so, do not think that you can survive this type of hurricane, especially if you are living along the coast. 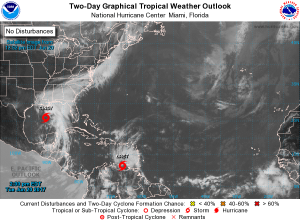 June marks the opening of the Atlantic Hurricane Season and we are already off to an active season with two tropical storms forming this week. June is not necessarily an active month for tropical cyclone development. Usually systems tend to form in the Gulf, as we are seeing with Tropical Storm Cindy. 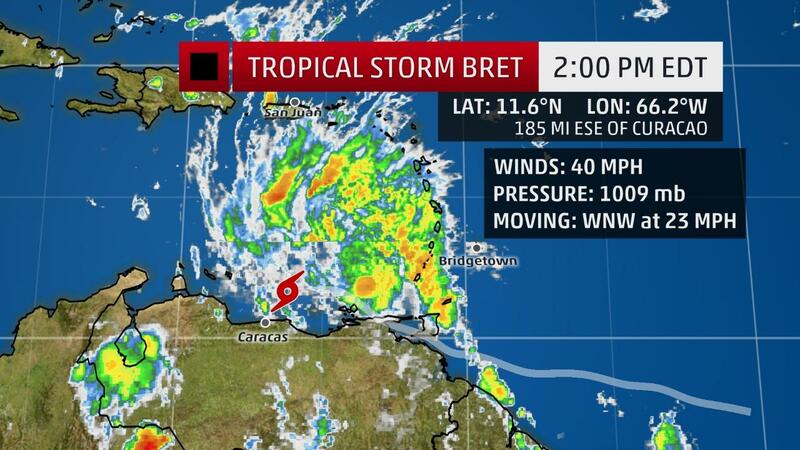 Tropical Storm Bret is being a “daredevil” and instead taking his chances in the Atlantic. Bret managed to form and even broke a record. 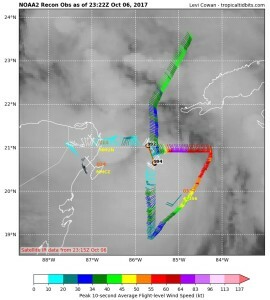 Tropical Storm Bret was named yesterday (June 19) after the Hurricane Hunters investigated the system and found tropical storm force winds surrounding the low pressure area. 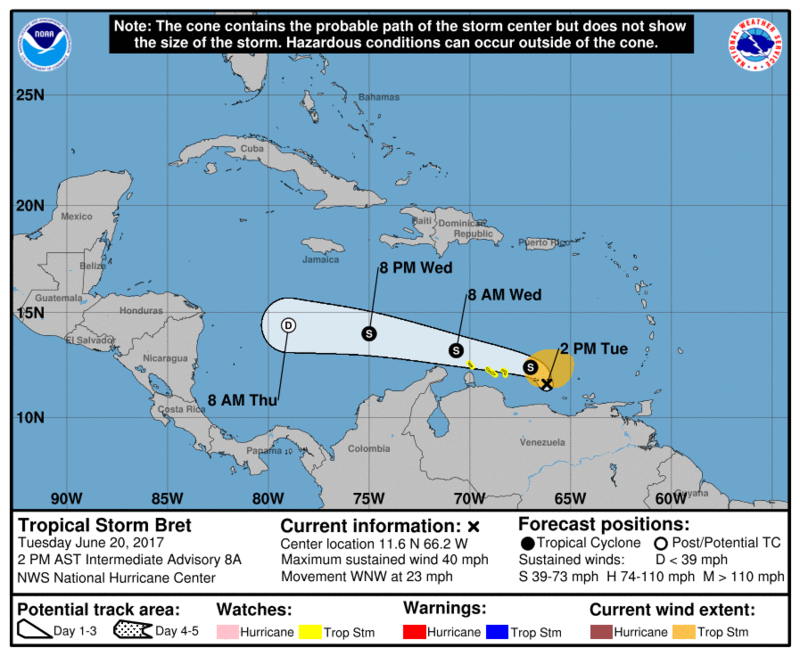 Bret has been a unique storm for the month of June. Meteorologists and the Hurricane Center have been watching this system with interest since it came off of Africa’s west coast about a week ago. Due to some cool sea surface temperatures (SSTs) the system did not organize until it reached close to the Windward Islands where is quickly organized into a tropical storm. What is so interesting about this system is its pathway and formation area. This system traveled close to the equator on its trip across the Atlantic. Hugging the equator allowed the storm to move mostly westward with very little change in direction. The closer a storm is to the equator, the less likely it will be picked up by the Bermuda High pressure system, which typically catches a hurricane and drags it on a more northwest pathway. Here is the main concern with tropical systems forming close to the equator: they have a better chance to impact land. Hurricane Matthew (2016) was an example similar to Bret, where it traveled close to the equator, avoided the Bermuda High, and then exited into the warm Caribbean where it blew up into its deadly Category 5 status. Once a tropical system passes the Windward Islands it becomes “trapped” in the warm waters of the Caribbean and is surrounded on all sides by land. No matter what direction the system goes in, someplace is going to be impacted. The good news is that we are not expecting Bret to become another deadly Matthew. The month of June is saving us. June is only the start of the hurricane season and SSTs are still rising with upper level wind shear values decreasing. Nevertheless, Bret utilized the warm waters currently in these southern Atlantic waters and slowly grew and evolved into a Tropical Storm as it approached the Windward Islands. 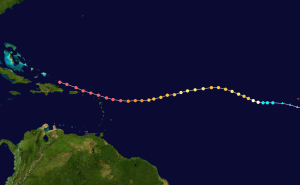 According to National Hurricane Center records, since Bret formed prior to June 22, it became the earliest named storm to form in this part of the Atlantic since official records were kept in 1851. Bret may hold a record, but it is struggling. This system was healthier yesterday but thanks to some violent wind shear squeezing the system on either side, the storm is having trouble staying together. Thunderstorms are shearing apart from the center of low pressure and are being pushed to the NNE of the storm. Most of the heavy rain is falling over the Caribbean Islands with the stronger winds currently over northern Venezuela. The main concern with this system will be heavy rains for the Caribbean Islands, particularly the Islands of Aruba, Bonaire and Curacao where a Tropical Storm Watch is currently in place. 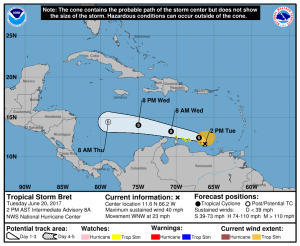 The latest update on Bret from the National Hurricane Center (NHC) (at the 5 pm advisory) is that it has been downgraded to a Tropical Depression and is quickly dissipating due to the high wind shear. The second trouble maker is Tropical Storm Cindy. 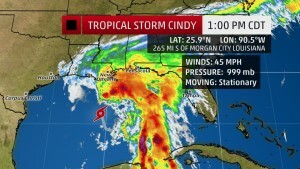 Cindy, unlike Bret, poses a larger problem, both in structure and in location. Upon first glance, Cindy is a mess. The structure does not look like a typical tropical storm (somewhat circular with the eye located in the center typically). Instead Cindy looks more like a subtropical storm, where the moisture is shifted to one side of the storm and the wind shifts to the opposite side (appears to have a frontal system attached to it). Cindy, like Bret, is in a harsh wind shear environment surrounded by heavy winds on either side. These winds are acting like a vacuum and pulling the cloud tops away from the center of low pressure and up to the NNE. It is quite a sight to see that clouds and moisture that are feeding into Cindy as far away as Atlantic Canada. This is making Cindy become a huge storm regardless of its Tropical Storm status. 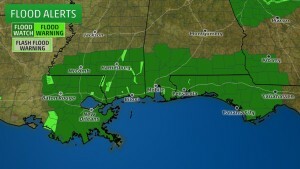 Tropical Storm Warnings are currently up for the Louisiana coastline and extending into eastern Texas. 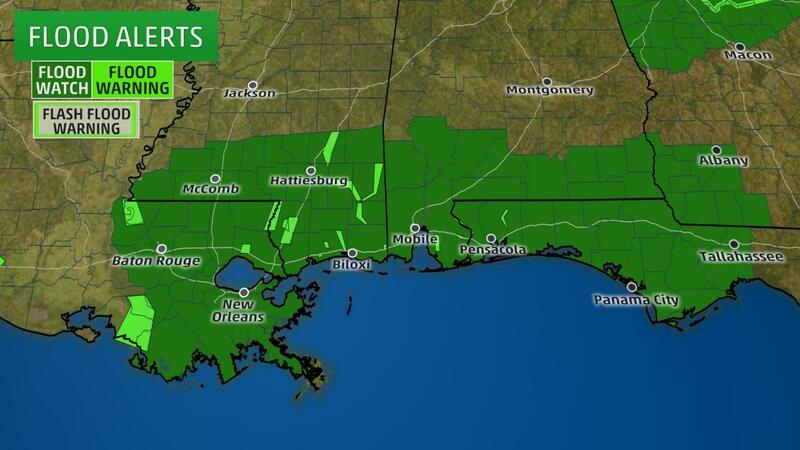 Regardless of landfall location, the majority of the eastern Gulf States will be experiencing heavy rain and flooding in some areas. Thanks to the immense size of Cindy some states have already been feeling the rain impacts for the past few days. Louisiana, Alabama, and Mississippi are expected to receive the brunt of the system. Emergency managers and meteorologists have already warned the public that flooding will be a major concern for the next few days. 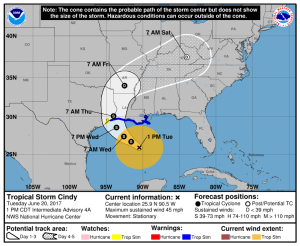 Cindy is expected to maintain Tropical Storm strength as it makes landfall overnight Wednesday and into Tuesday close to the Louisiana and Texas border. 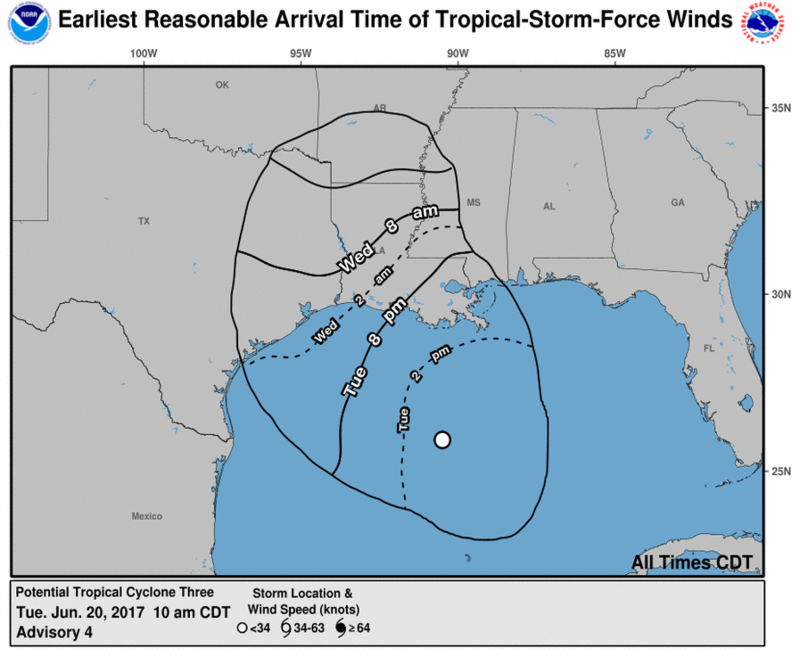 Forecasted Track by the National Hurricane Center for Tropical Storm Cindy including Arrival Time of Tropical Storm Force Winds. Cindy will be unique once she makes landfall depending on the wind shear levels. If the wind shear levels remain relatively the same and continue to pull the moisture to the NNE of Cindy, the west side of the center of low pressure (eye) will be considered a drier side with heavy Tropical Storm force winds. 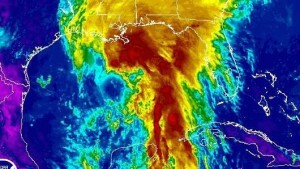 Upon landfall, the east side of the eye will receive the brunt of the rain and flooding. It is still possible for Cindy to accumulate a more “typical shape” but only if the wind shear dies down. At the moment this does not seem likely. Wind Shear Values (red and orange high, blue and green low). Cindy is managing to fight off the wind shear and keep her center of low pressure close to more favorable environments. It is unlikely that Cindy will evolve into a hurricane, and we have the surrounding wind shear to thank for this. So far the only component that is benefiting Cindy are the warm SSTs below her in the Gulf of Mexico. 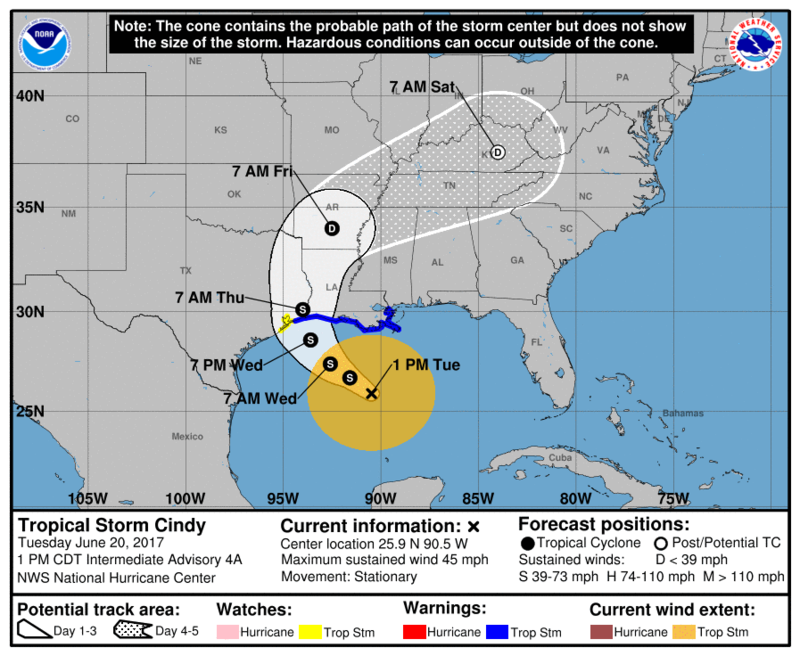 Cindy is utilizing these temperatures for the moment as she sits almost stationary in this favorable area drifting very slowly to the NNW towards the Gulf States. If Cindy were to evolve into a hurricane, this is her only opportunity and time is running out fast. As a hurricane becomes stationary it can cool the temperatures of the water below with its rains. As the water cools the energy from the ocean becomes harder and harder to utilize for the storm and eventually the surface becomes too cool for the hurricane to evolve or continue developing. Regardless Cindy is expected to maintain Tropical Storm status as she moves closer and closer to shore. 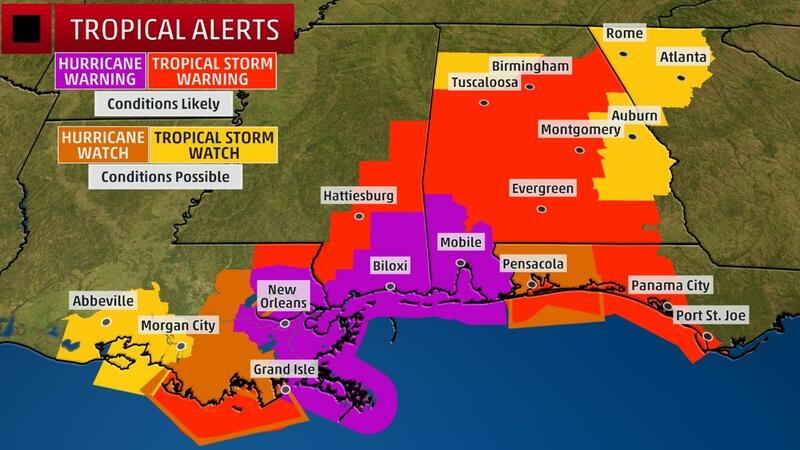 Warnings have been posted across the Gulf States with government officials and meteorologists preparing and informing the public on the approaching storm. Just because a system is classified as a Tropical Storm does not mean it should be cast aside, especially one of this size. Cindy is huge, and the main threat are the rains and flooding potential. Areas are already heavily saturated because of these rains that have been falling for the past few days before Cindy’s arrival. This increases the flooding risk. Hurricane Sandy (2012) is a good reminder of how the size of a system matters. Sandy was labeled a Category 1 but broke the record for the largest hurricane in the Atlantic. When it impacted land the storm surge and flooding damage made Sandy look closer to a Categroy 4 or 5 storm, not a Category 1. Now is the time to take Cindy seriously and prepare while she continues to remain stationary over the Gulf of Mexico. Sand bagging around your property to minimilize flooding damage is a good first step. Moving valuables into the second story of your house is recommended. If you know that you live in an area prone to flooding, consider evacuating before Cindy approaches Wednesday night. Once again, it is the rain and flooding that make this storm formidable, not the winds which the Saffir-Simpson Wind Scale categorizes these systems on. 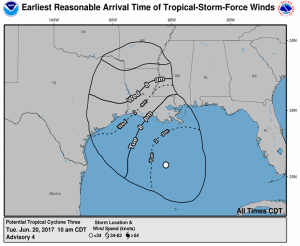 Tropical Storm Cindy and the Approx. 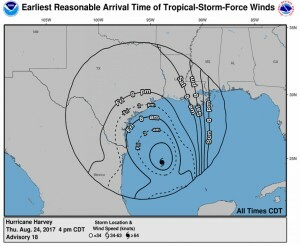 Arrival Time of Tropical Storm Force Winds Courtesy of NOAA. The above map only showed “times” as AM or PM. The Hurricane Center has now narrowed the field down to give emergency managers and meteorologist an approximate hour that hurricane force winds will arrive to an area. This may not sound like a big deal to many, but this allows for emergency crew members to prepare up to the final hour possible. Another change for the 2017 Atlantic Hurricane Season is “potential tropical cyclone” advisories. You may have heard on the television or radio this term being used to describe Cindy. Prior to Cindy being named this morning, she was known as “Potential Tropical Cyclone Three.” Originally, the Hurricane Center did not put out advisories or warnings with storms that were likely to form. 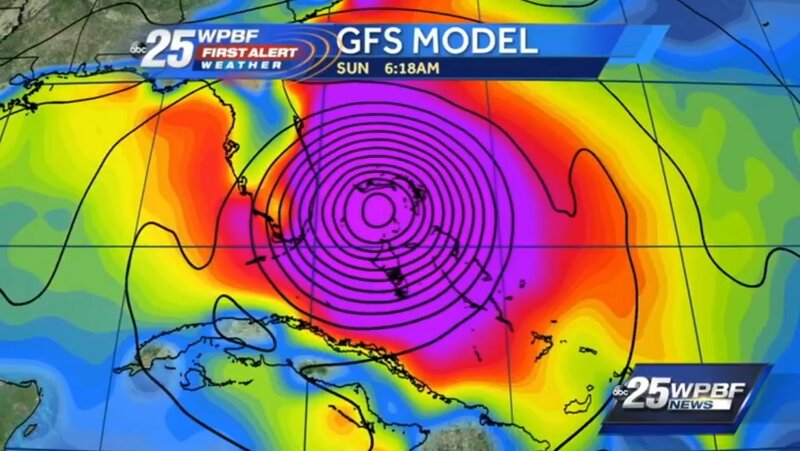 This, in my opinion, is a huge step forward for hurricane forecasting and protecting the public. The Hurricane Center will be focusing on systems that have the potential to strengthen and evolve into tropical cyclones which will give extra preparation and warning time to the public. It is already proving to be beneficial with Cindy. 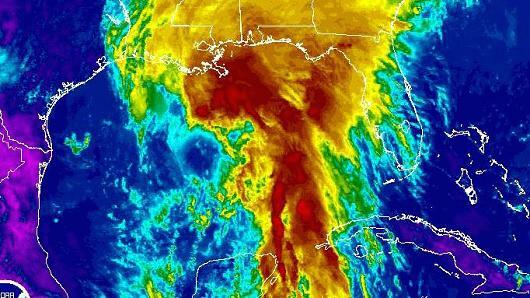 Prior to Cindy being dubbed a Tropical Storm the National Hurricane Center put up Tropical Storm Warnings along areas of the Gulf Coast. Prior to 2017, these warnings were not put up until the storm was classified a Tropical Storm. Nice change, right? 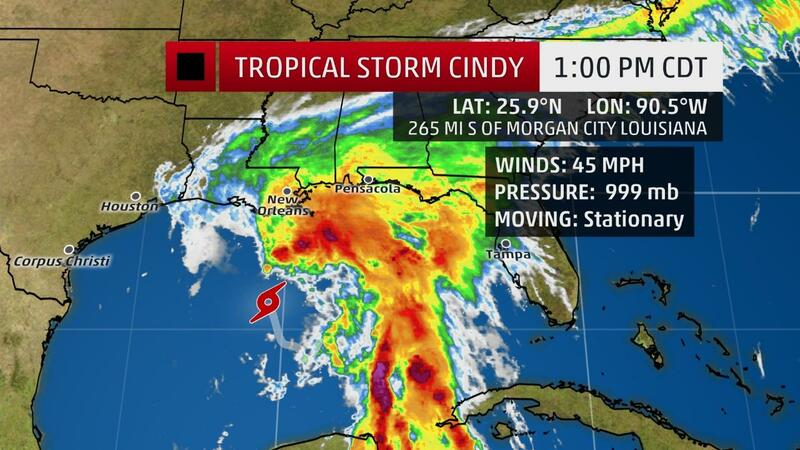 In closing, Cindy is approaching and bringing a massive amount of moisture with her. Now is the time to prepare. Hurricane Season is just starting and we have a long season ahead of us which is already shaping up to be pretty active. Let’s not take Cindy for granted and instead prepare for her arrival Wednesday night. The 2017 Atlantic Hurricane Season Opens! What is Expected? It is that time of year again! The 2017 Atlantic Hurricane Season is officially opened! All eyes shift to the North Atlantic now as the probability of a storm forming increases. 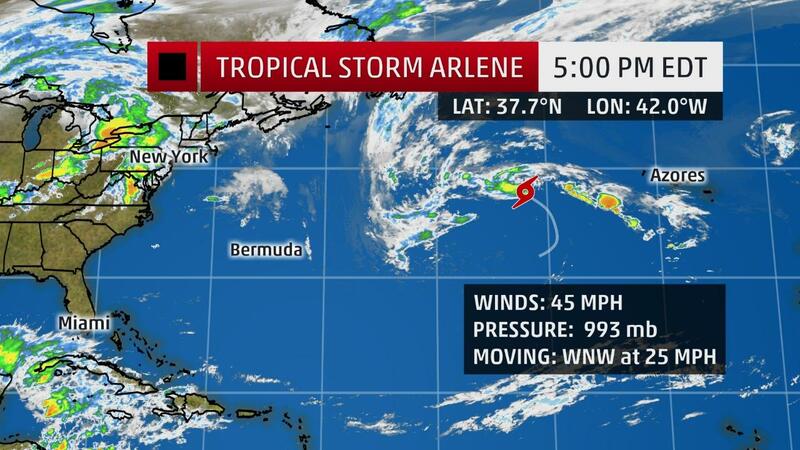 However, remember back in April when we were visited by a stray tropical storm named Arlene? 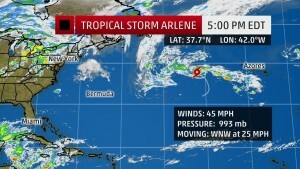 Arlene set a record for being the second recorded storm in the satellite era to form in the month of April. In addition, 2017 is now the third consecutive year that the first hurricane formed before the official start of the hurricane season (June 1st each year). Already we are off to an early start! Now that Arlene has been named we are now on the lookout for Bret. 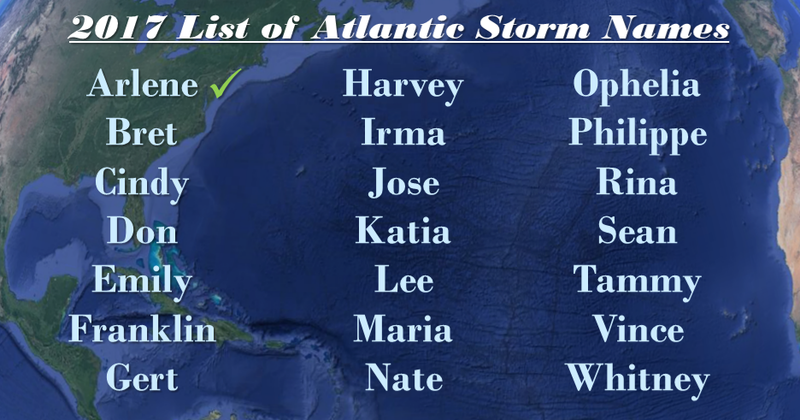 List of Hurricane Names that will be used for the 2017 Hurricane Season. We also get to welcome a new name to the 2017 list: Irma. This name replaces the devestating Hurricane Irene back in 2011 which affected the Caribbean Islands, the Bahamas, and the eastern United States killing over 50 people. 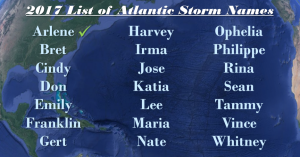 The National Hurricane Center rotates their Hurricane list every 6 years and replaces the names of storms that have been retired with brand new names. Retired hurricane names occur when a storm produces immense damage or loss of life. These storms are never again used once retired. Therefore, Irene was retired and replaced with Irma. Let’s move onto the topic that many are wondering about: how active will 2017 be? Good news for hurricane researchers, bad news for the rest of society. We are expecting an above average hurricane season for 2017. 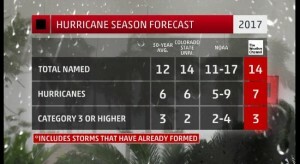 Hurricane Season Outlook from NOAA, Colorado State, and The Weather Channel (image courtesy of the Weather Channel). 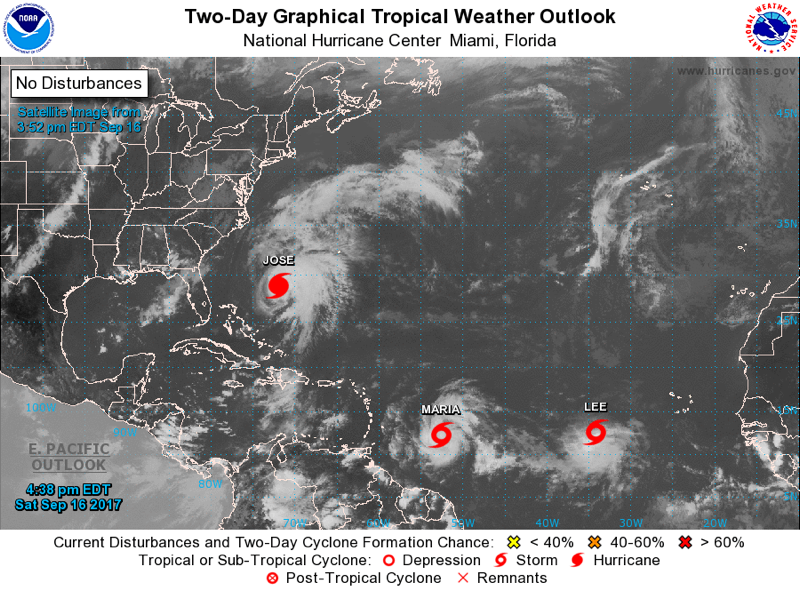 Above are three forecasts which show the predictions meteorologists and climatologists made regarding the 2017 Atlantic Hurricane Season. 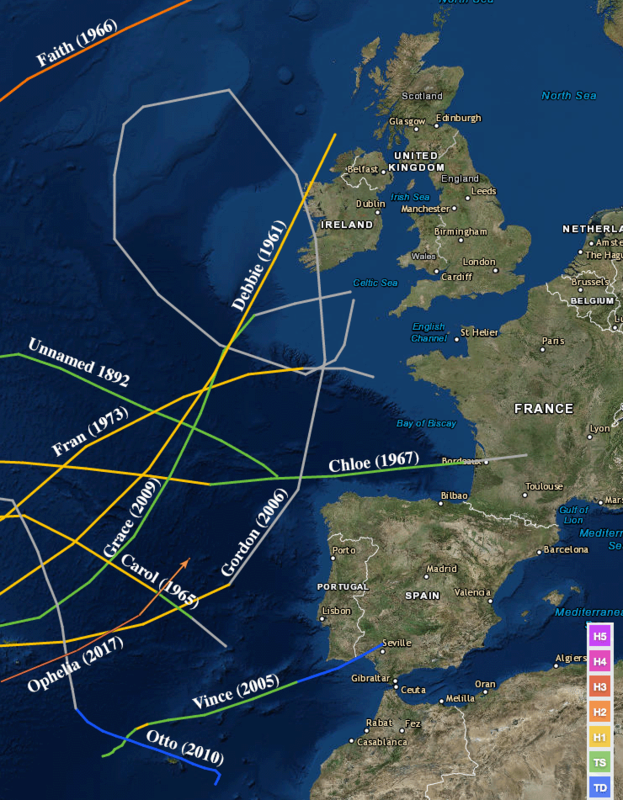 On average the Atlantic experiences about 12 named storms on average each year (according to a 30 year record). Forecasters are expecting the season to produce a few more storms than normal, about 11 – 17 tropical cyclones. In addition, the number of storms evolving into hurricanes will be slightly increased by about 1 or 2. On average about 6 storms each year become hurricanes with winds of 74 mph and greater. Finally, meteorologists are predicting not much of a change with regards to the number of major hurricanes (category 3 or higher). The North Atlantic usually sees about 3 storms each year become major hurricanes. 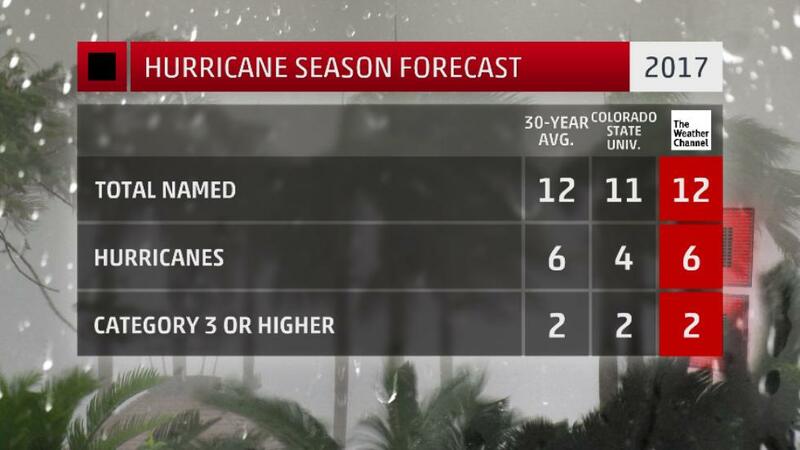 Forecasts are aiming for a near average season when it comes to the development of major hurricanes. Now how do we know that this forecast is correct? In truth, we will not know until the season ends. Such is the beauty of meteorology. However, we are making an educated guess based on what we are currently experiencing, what we could be experiencing, as well as what happened this past winter. Winter, for the most part, was pretty mild across North America compared to previous years. 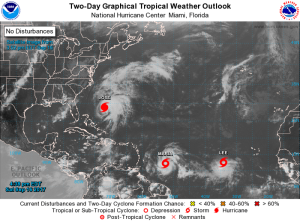 Thanks to the warmer than average temperatures, the Atlantic Ocean managed to maintain some of its heat which is a big contributor to the formation of tropical cyclones. Looking above at the current sea surface temperature (SST) map we are experiencing temperatures that are slightly below the temperature requirement needed for tropical development (around 26.5°C). In the mid-north Atlantic we are experiencing SST’s between 22 and 25°C, which is getting close to the development point, but still a little on the cool side. However, down in the Caribbean and in the Gulf of Mexico we are experiencing perfect conditions for fueling storms. Temperatures of between 29 and 30°C have been recorded this week. A good sign for beach goers but a bad sign if you want to avoid storm formation. Luckily, there is nothing developing in these areas at the moment, but with SSTs in this range, that probably won’t last long. Finally, even though the open North Atlantic Ocean may not be warm enough for cyclone formation yet it is important to look at the SST anomalies which determine if the ocean is warmer or cooler than average for this time of the year. Minus a patch of cooler than normal waters in the center of the North Atlantic, the majority of the ocean is above normal by about 1-3°C. This may not sound like a lot but now that summer has arrived (and many of us are already feeling the heat) these SST will start to skyrocket rapidly over the next few weeks, easily pushing into the convective 26.5°C zone. The warmer than normal SSTs was the main factor which drove meteorological agencies to call for an above average hurricane season this year. However, there is one other component that has been tricky to forecast the past few months: El Niño. Currently, we are in a La Nada phase (neutral). This means that the Pacific Ocean (where El Niño/La Nina events take place) is not experiencing higher/cooler than normal SSTs. Everything is “normal” in the Pacific Ocean at the moment. However, a few changes are starting to pop up with SSTs rising very slowly in the Pacific off the west coast of South America. This is indicating that another El Niño is trying to form. Over the 2016-2017 winter, meteorologists and climatologists were predicting that an El Niño would form around the beginning of summer, just in time for hurricane season. If this were true hurricane formation would have been hindered due to SSTs generally becoming cooler in the Atlantic and heavy wind shear being pushed over the ocean basin which hinders storms from developing. An El Niño formation would have meant a quiet hurricane season for the Atlantic and an increased season for the Pacific. Nevertheless, this forecast did not happen. There is still something trying to form in the Pacific but it is not strengthening as rapidly as many thought it would. Colorado State was one of the first weather agencies to release their predictions on the 2017 Atlantic Hurricane Season this year. Originally they called for a below to near average hurricane season due the possibility of an El Niño forming. 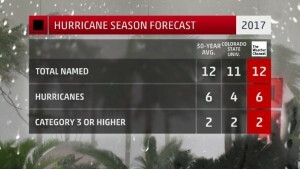 However, they have updated their prediction to an average to slightly above average hurricane season. El Niño is still a possibility later this year. However, for the moment the SSTs are becoming prime for hurricane formation over the majority of the Atlantic. What could happen is that an El Niño starts to take shape during the late summer and early fall time, right when the peak of hurricane season comes around (September-October). If an El Niño emerges at that point SSTs will (statistically) start to decrease and wind shear values will increase causing problems for hurricane formation. This could be good. Most major hurricanes usually form later in the hurricane year during the peak months. If an El Niño does occur it can hinder the strengthening of many hurricanes and keep the number of major hurricanes at a minimum. At this moment we cannot say for certain an El Niño will form or how strong it will be. Over the next couple of months climatologists and meteorologists should receive a better indication on if an El Niño is forming in the Pacific. Regardless of a developing El Niño it is important to note that regardless of how many hurricanes form this season this is the time to prepare. 2016 finally ended the Florida hurricane drought after a long (and lucky) 10 year stretch. Hermine was the hurricane that ended this streak and not too long after we had major Hurricane Matthew give Floridians a wake up call. Matthew was a reminder that the United States is vulnerable to major hurricanes even though the country has been lucky the past few years. This leads to the next topic. 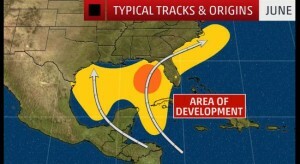 The Florida hurricane drought may be over, however, there is another serious drought revolving around tropical cyclones. The United States is entering into its 12th year of a “major hurricane drought.” Believe it or not, the last major hurricane (Cat.3 or higher) to have made landfall in the United States was Hurricane Wilma back in October of 2005. Another Early Start to the Atlantic Hurricane Season. What Does this Mean for 2017? Arlene is trying to become more organized but is being hindered by the cold sea surface temperatures in the northern latitudes. The image above shows a clear tropical circulation pattern but many of the thunderstorms are spreading outwards away from the center of low pressure indicating a weakening trend. Arlene may have utilized the low levels of wind sheer and slightly warmer temperatures coming from the Gulf Stream this past week to help grow into a tropical storm; but now Arlene is hanging over sea surface temperatures between 65 and 70°F. A tropical system usually needs waters closer to 80°F in order to grow and evolve and Arlene is nowhere near these temperatures. So far the only component helping Arlene is the low wind shear values. 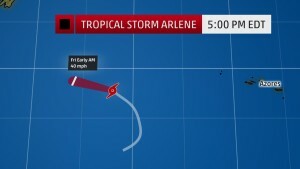 Though hard to see, Arlene is located in the green area in the top right of the figure. This area has minimal wind shear and thus allows for a hurricane to grow and strengthen. 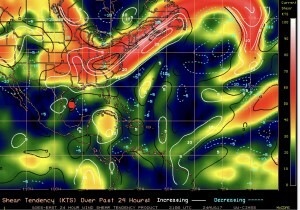 The higher the wind shear (denoted in red from the figure above) the less likely a cyclone will form. 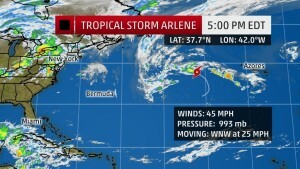 Arlene managed to find the one patch of calm wind shear in the whole North Atlantic and began to intensify and grow into a Tropical Storm. Arlene will not be staying in this area long though. Currently drifting northwest at a speedy 25 mph she is approaching the Canadian Maritimes. However, the good news is that Canada has nothing to fear. The Tropical Storm will eventually enter into an area of heavy wind shear and be torn apart, along with the cold sea temperatures that will cut off the fuel source to the storm. Regardless, Arlene has managed to survive and grow to be a formidable storm, plus a rare system to form this early in the year. Those of you in the Canadian Maritimes can rest easy. A few showers and some gust winds will impact these areas as Arlene dissipated but nothing major is expected at this time. Arlene is now the second tropical system to form in the month of April since satellite technology was implemented. 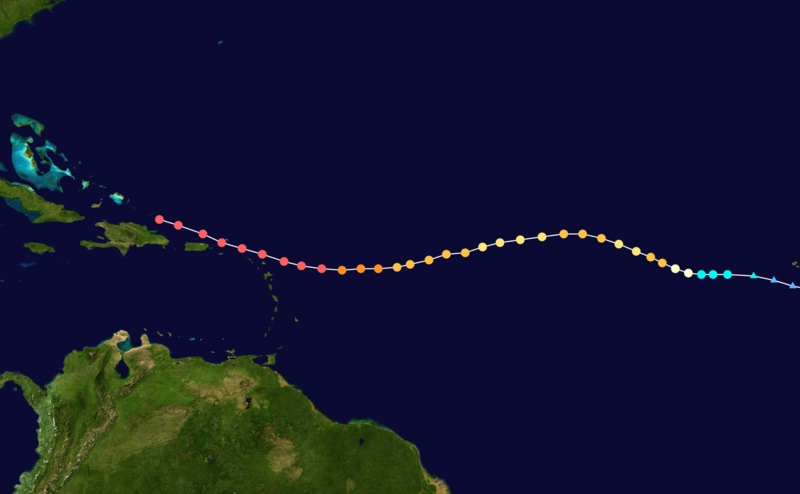 The last storm to form in the month of April was Tropical Storm Ana in 2003. The question is: now that we have seen a storm form early in the season, does this indicate that the 2017 Hurricane Season will be active? The answer is no. It is rare for storms to form outside of the official Hurricane Season (June 1 -November 30) but it does not indicate how active the season as a whole will be. 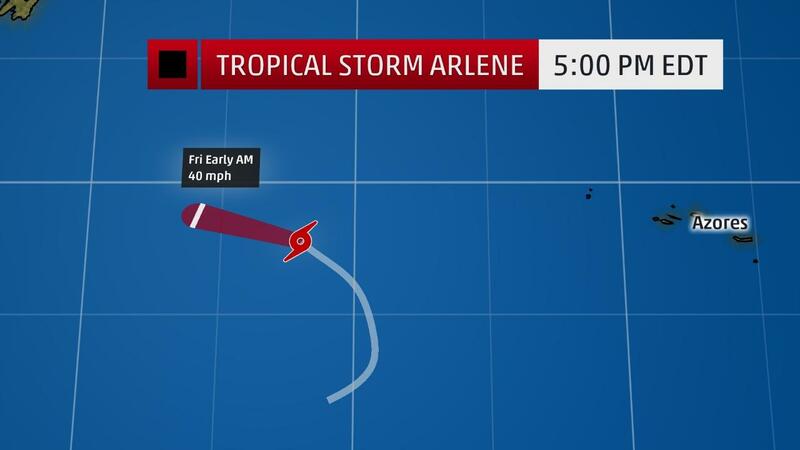 Arlene happened to be in the right place at the right time and this is why a Tropical Storm was born. On that note, what are we expecting for the 2017 Hurricane Season? Colorado State and The Weather Channel released their 2017 Atlantic Hurricane Season outlook a few weeks ago. We are expecting this season to be slightly below average to near average for the most part with predictions of 12 total storms being formed and 2 of them possibly reaching major hurricane status (Category 3 and higher). Last year was a wild ride for the Atlantic with notable storms such as Hermine, Nicole and Matthew. This year, it will be a little bit on the quiet side due to the el Niño making a comeback in the Pacific. This will begin to cool our sea water’s in the Atlantic and hinder many storms from forming. Though this el Niño is not expected to be as powerful as the 2015 one, it will still play a role in the frequency of hurricanes forming this year both in the Atlantic and worldwide. We are still 41 days away from the official start of the Atlantic Hurricane Season and already we have our first named storm. Regardless of the month, a storm can still form under the right conditions. 2016 was a reminder to many of us to always be prepared regardless of how active a season is forecasted to be. Get your emergency kits ready and brush up on your hurricane knowledge because Hurricane Season 2017 is starting to ramp up. Weather Goddess | Powered by Mantra & WordPress.